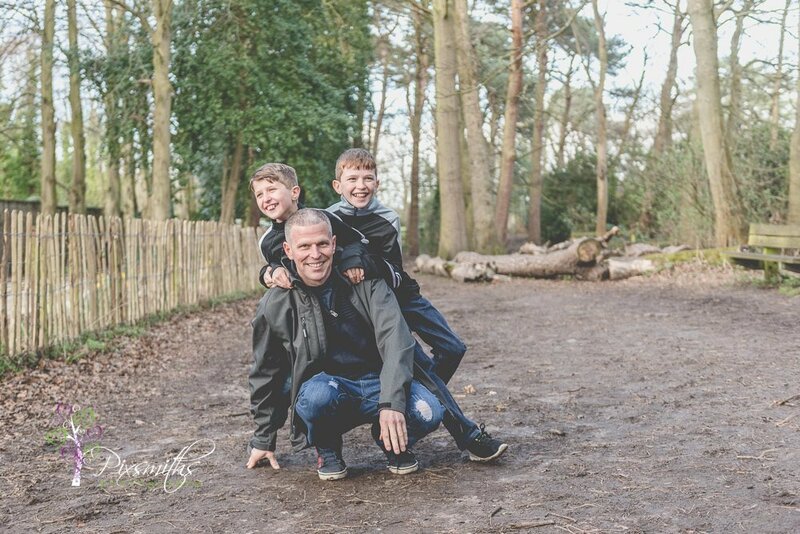 It’s always good to get some pics on your own too so we suggest a responsible adult comes along to look after any young children whilst teh couple have their own portraits. 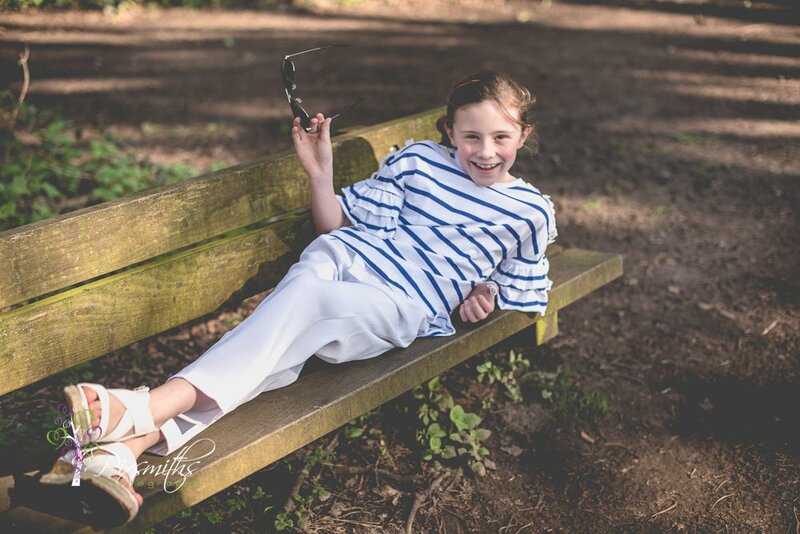 Our style is very natural, not over posey. 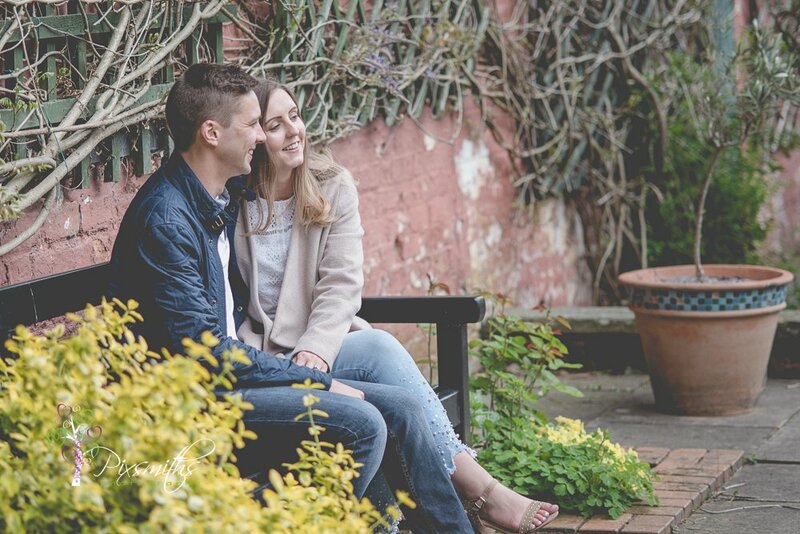 We want our couples to engage with each other and that is exactly what Emma & Kevin did. 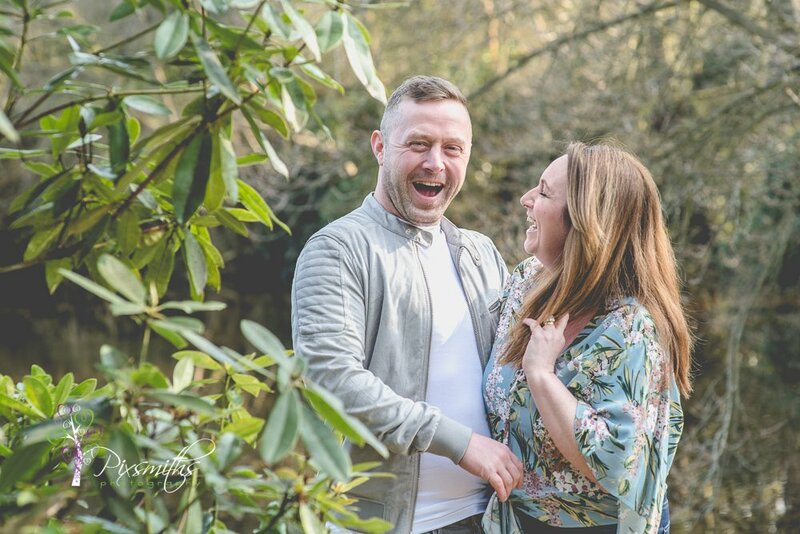 Lots of smiles and laughter at the ready. 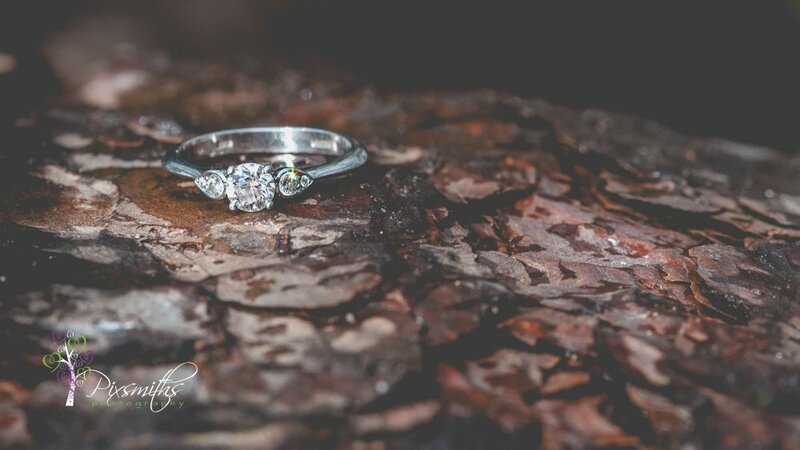 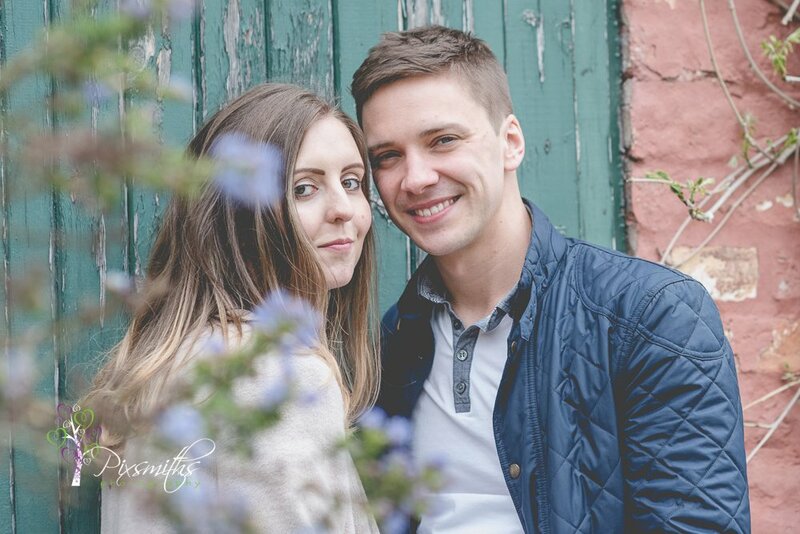 Really going to enjoy their spring wedding at Inglewood Manor. 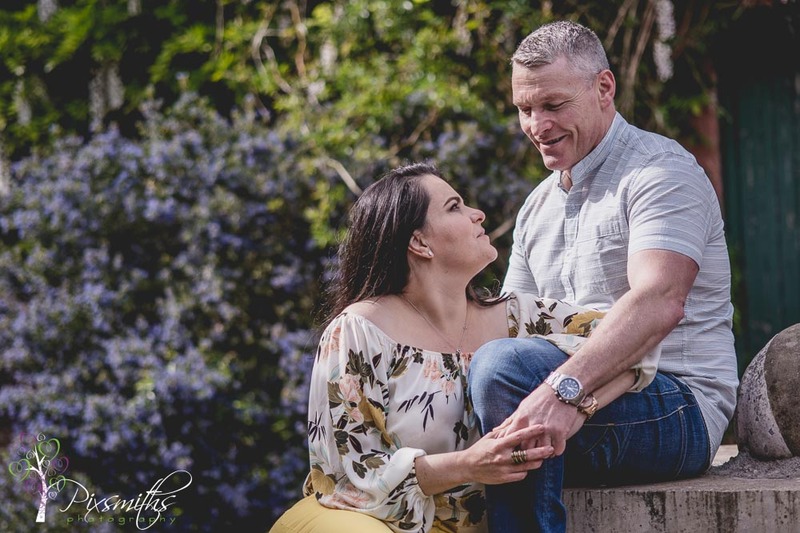 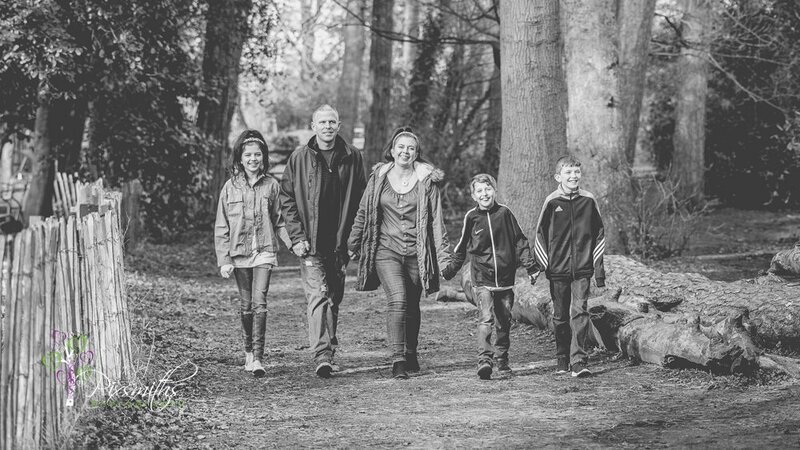 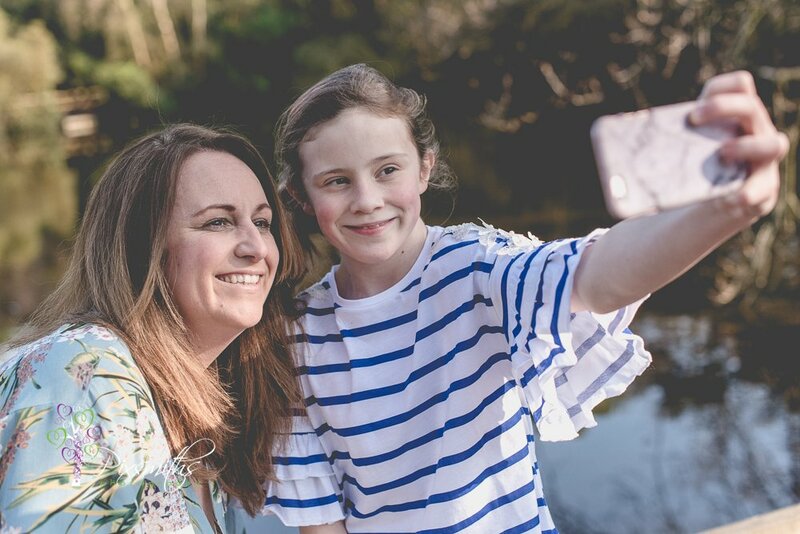 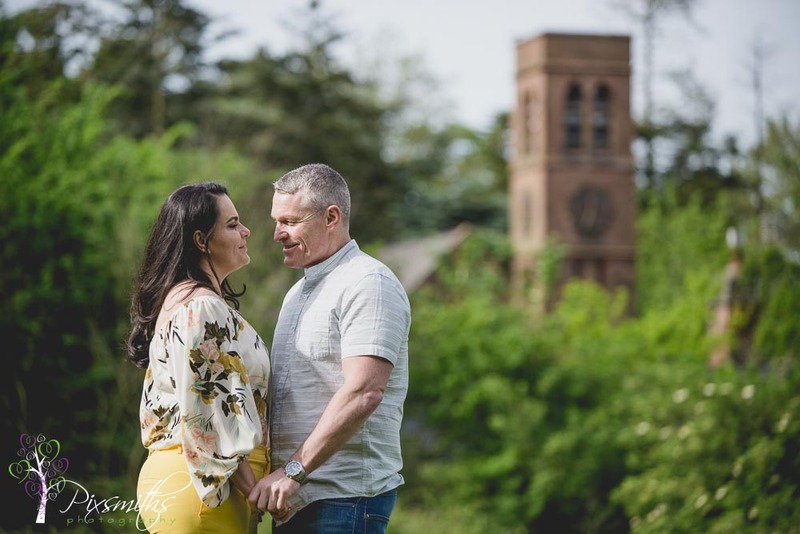 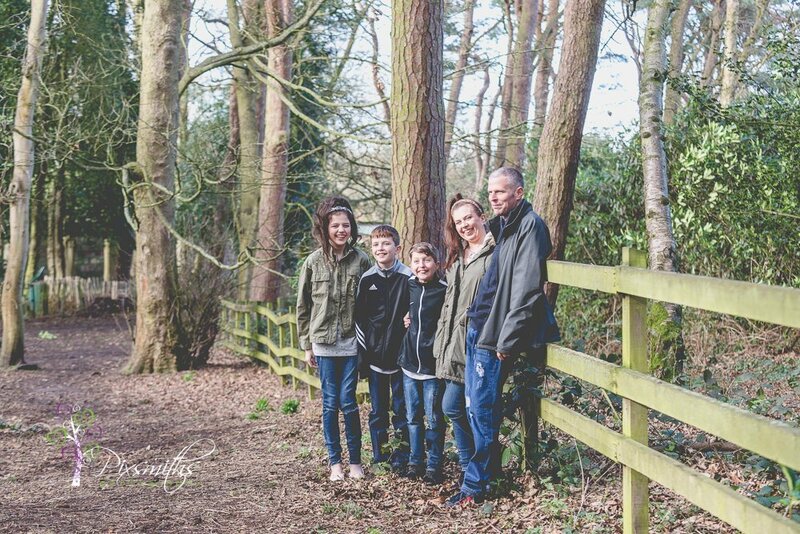 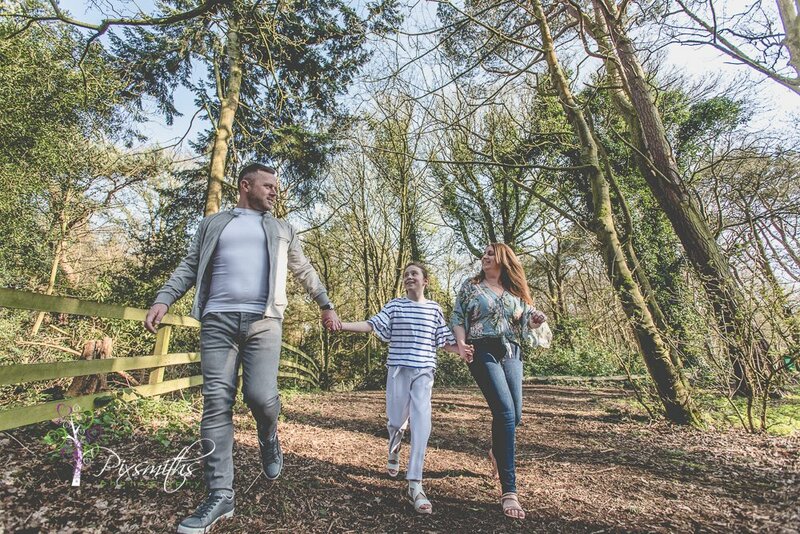 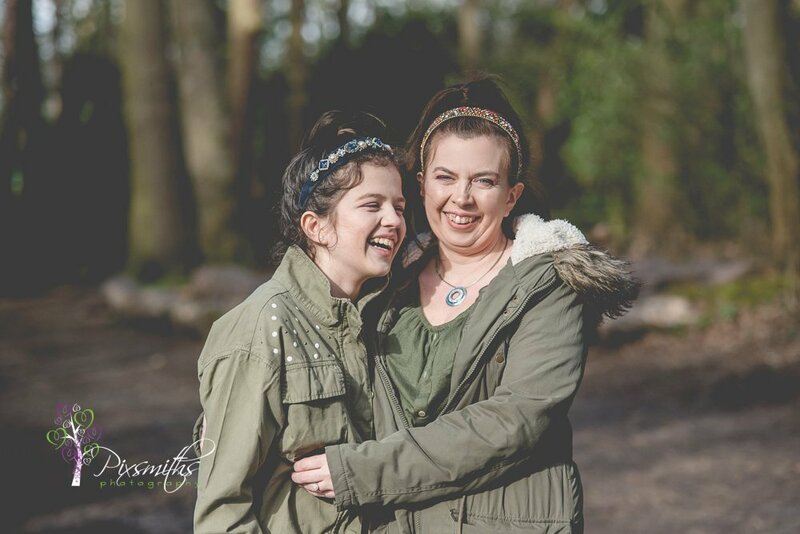 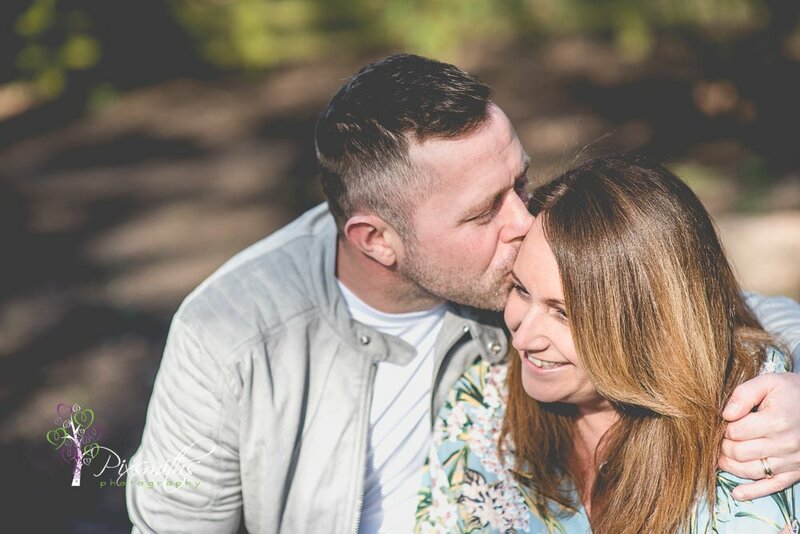 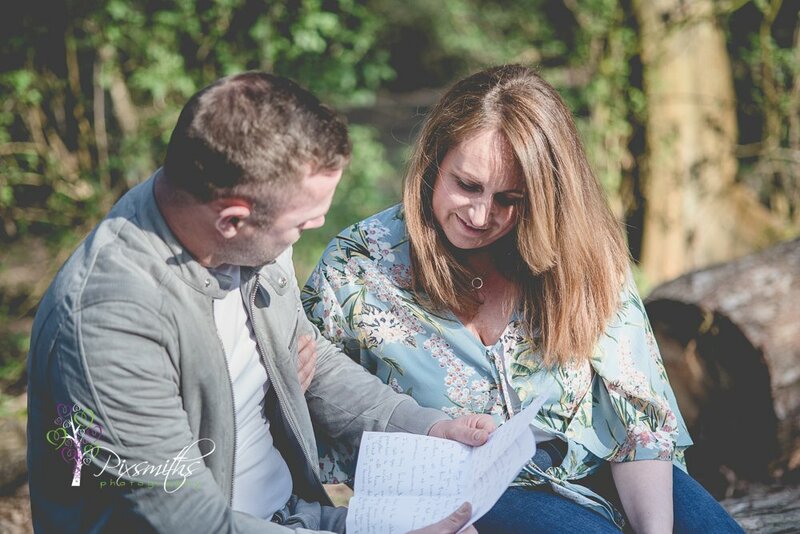 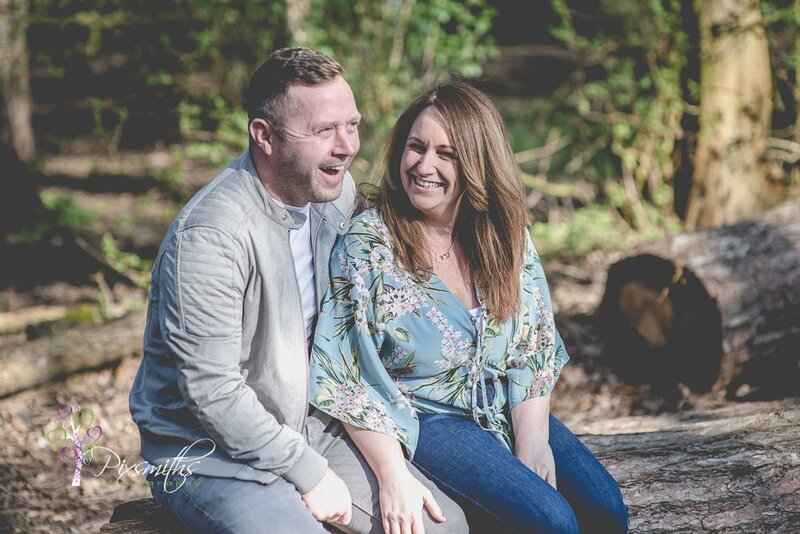 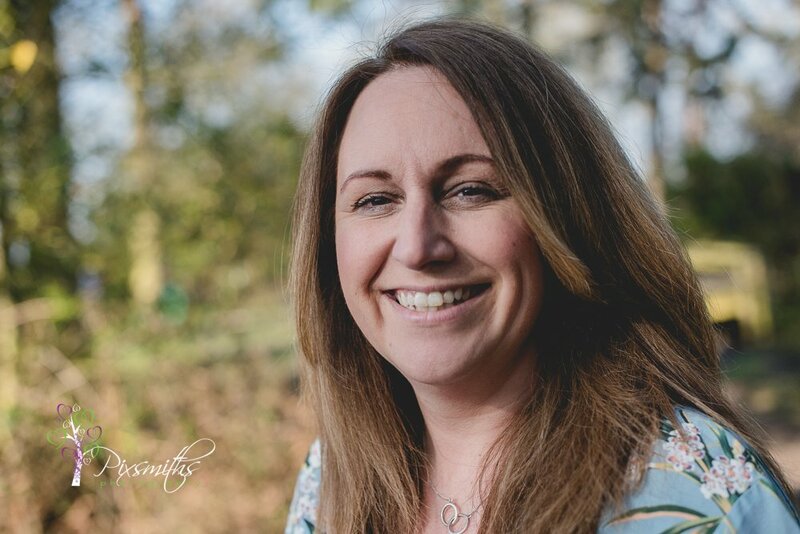 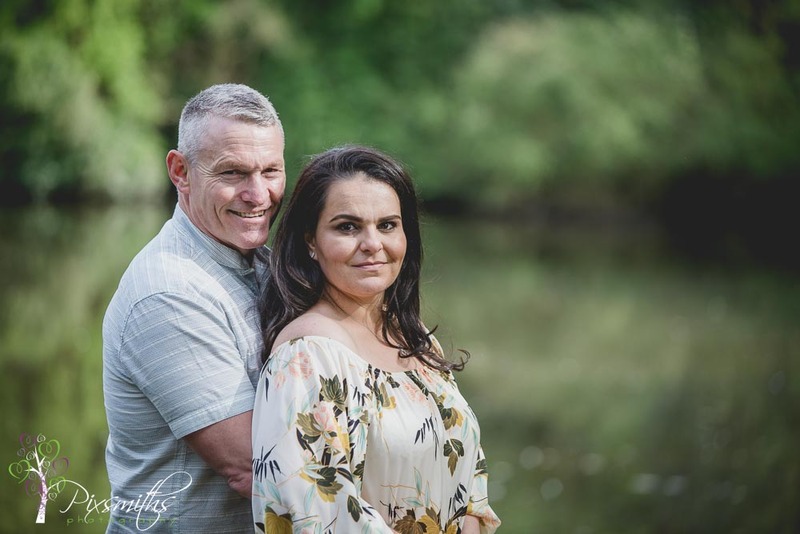 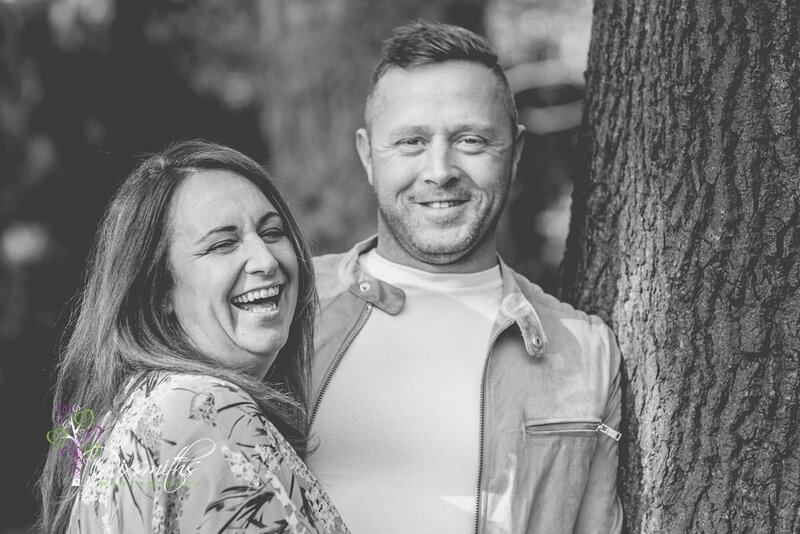 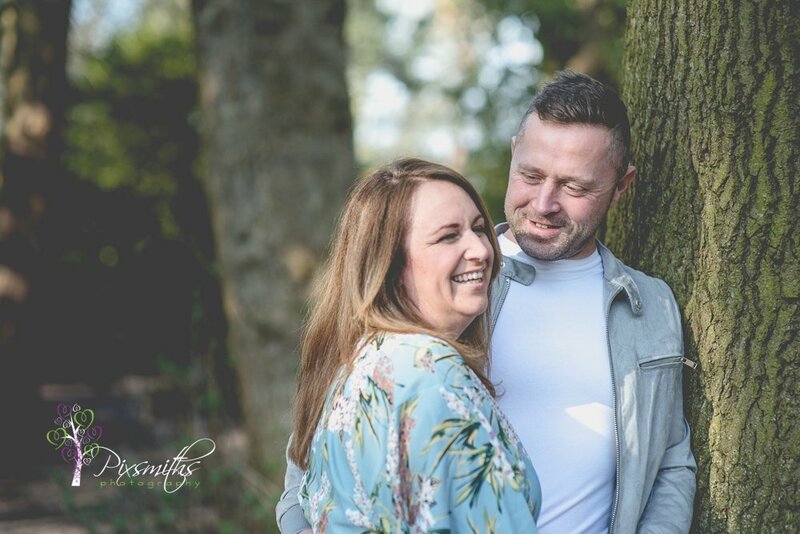 It was lovely to meet mum and the family too on this pre wedding shoot in our favourite local park on the Wirral – Royden Park. 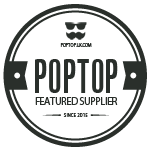 Still plenty of other options to enjoy. 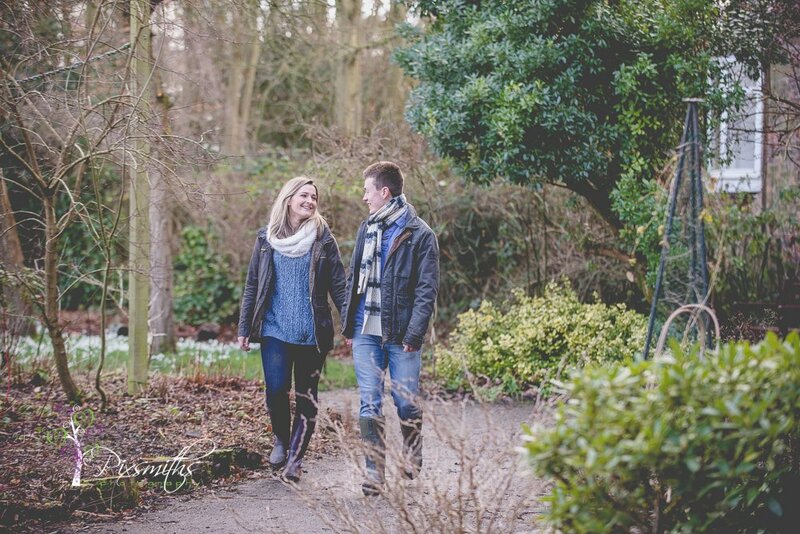 The daffodils made for a beautiful frame. 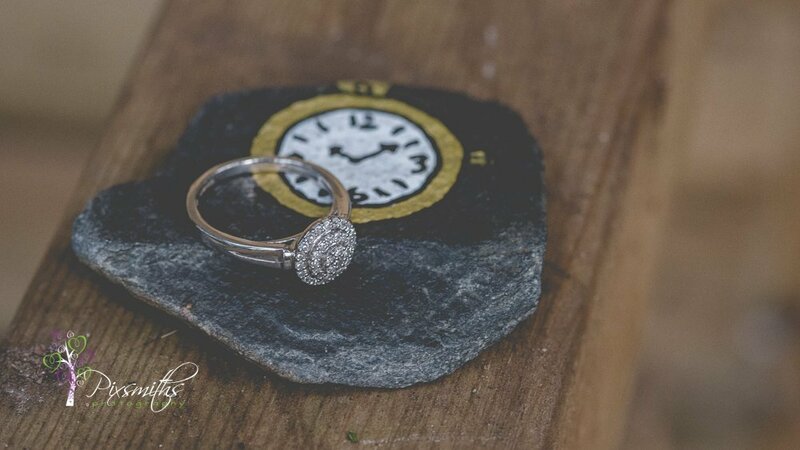 Emma spotted a Wirral rocks pebble which made for a unique ring shot. 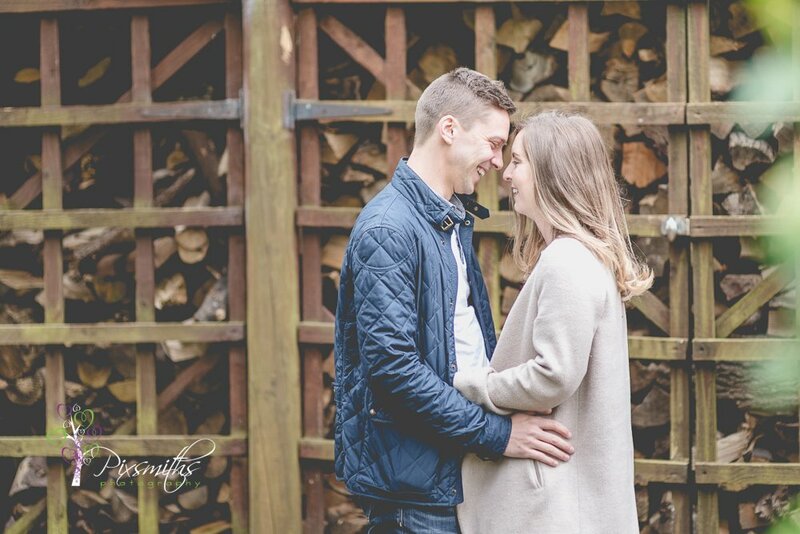 Enjoy these highlights, just a few weeks to go til the wedding itself. 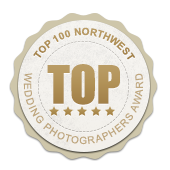 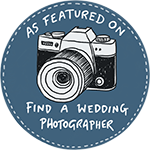 – they have wall space they wish to fill with images from their pre- wedding shoot, wedding and then honeymoon. 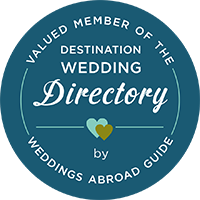 We did offer to travel too! 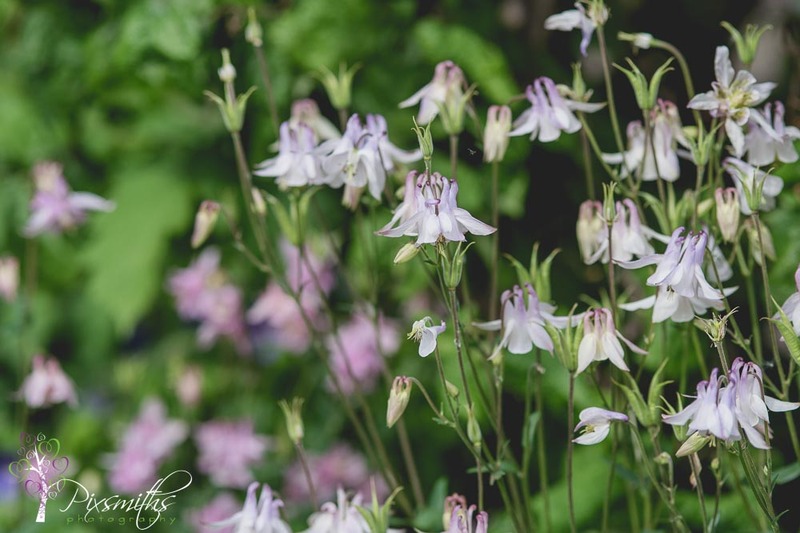 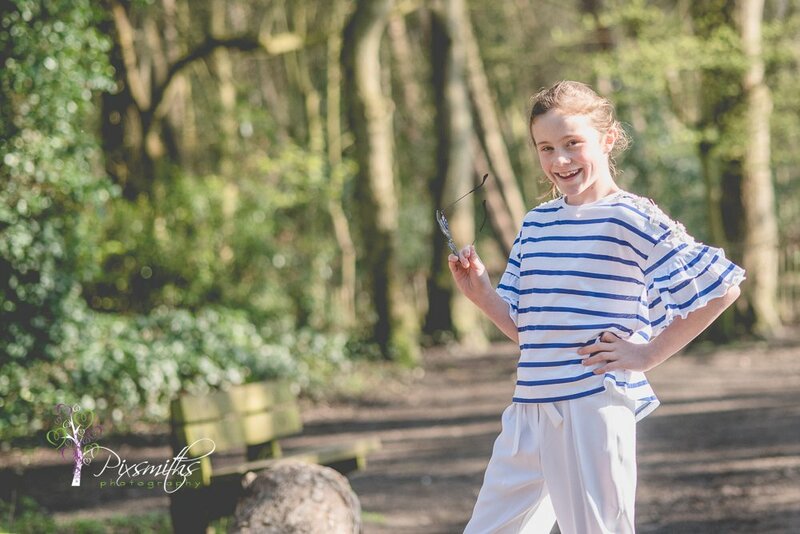 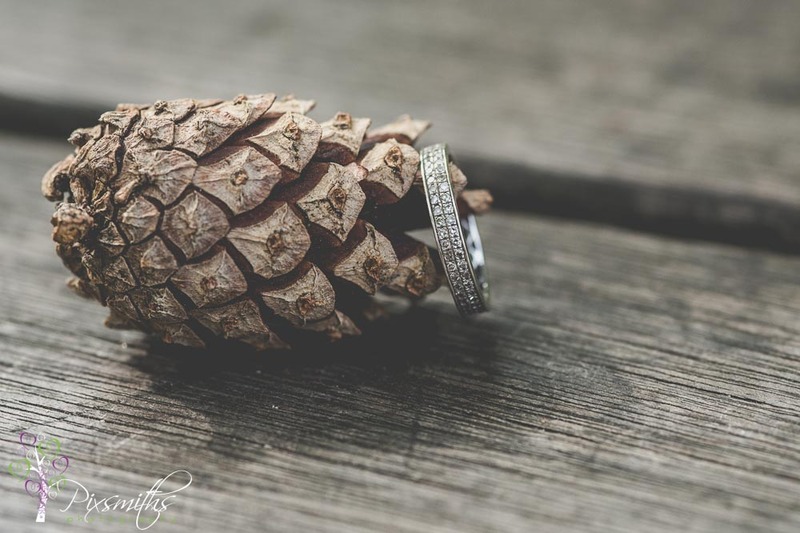 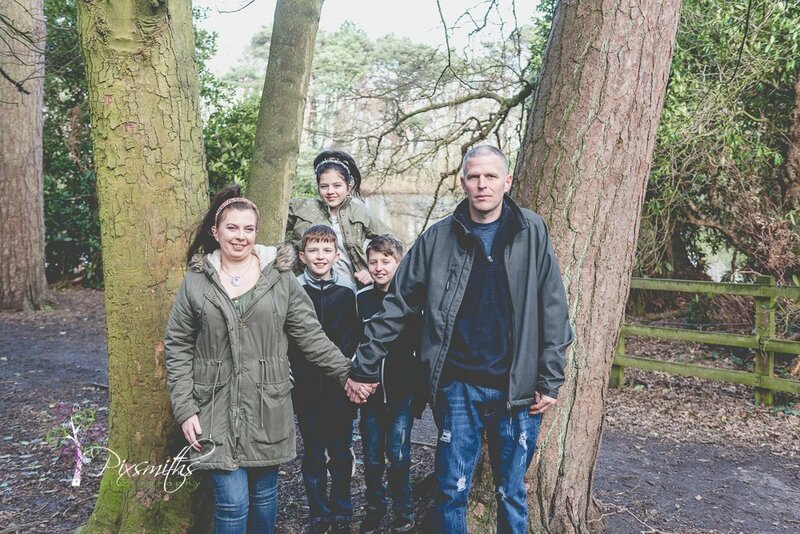 We had a fun afternoon in Royden Country Park, chatting and strolling as we took some images. 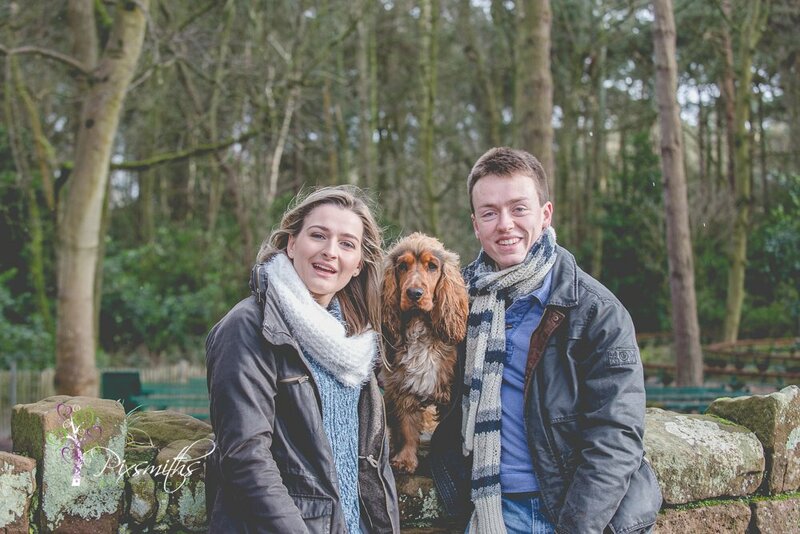 Of course Jasper being an important part of their lives came along too. 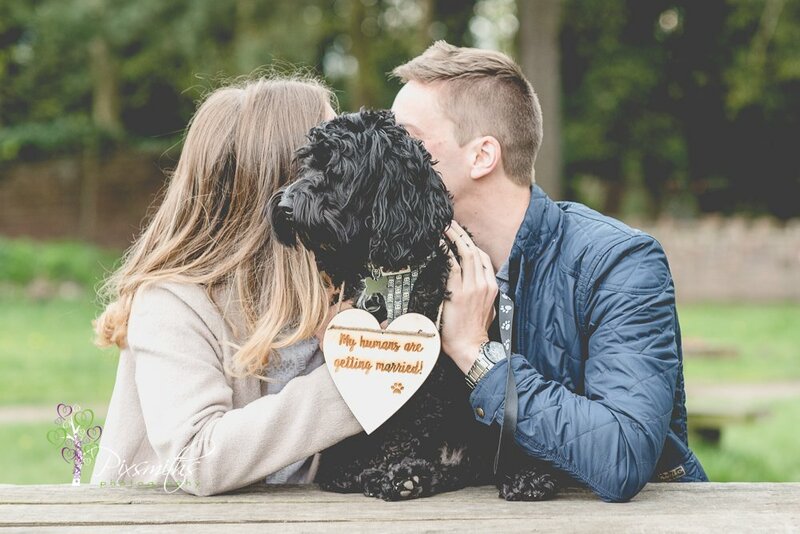 he even had a special placard message to display. 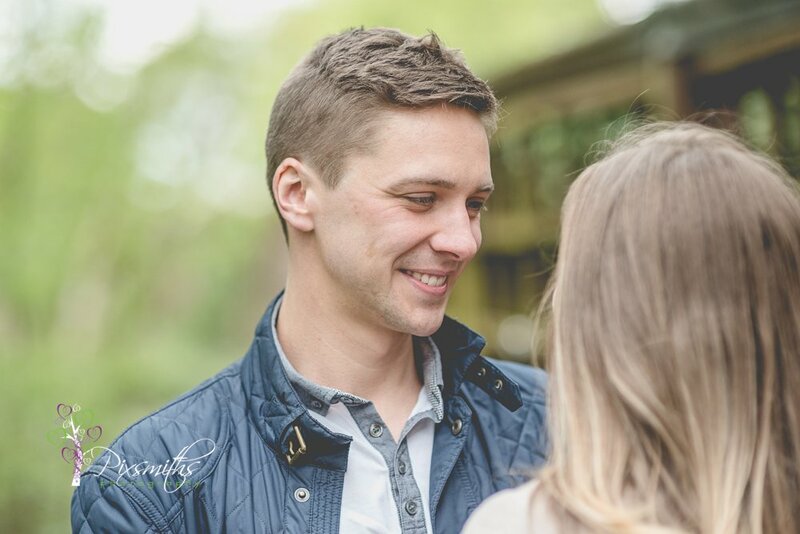 He looked pleased as punch with himself. 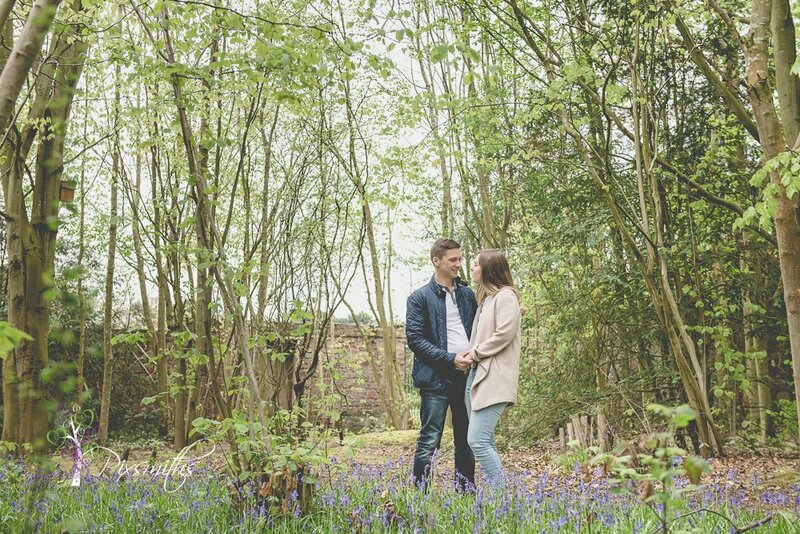 We spent a few mins in the walled garden, hey the bluebells are out! 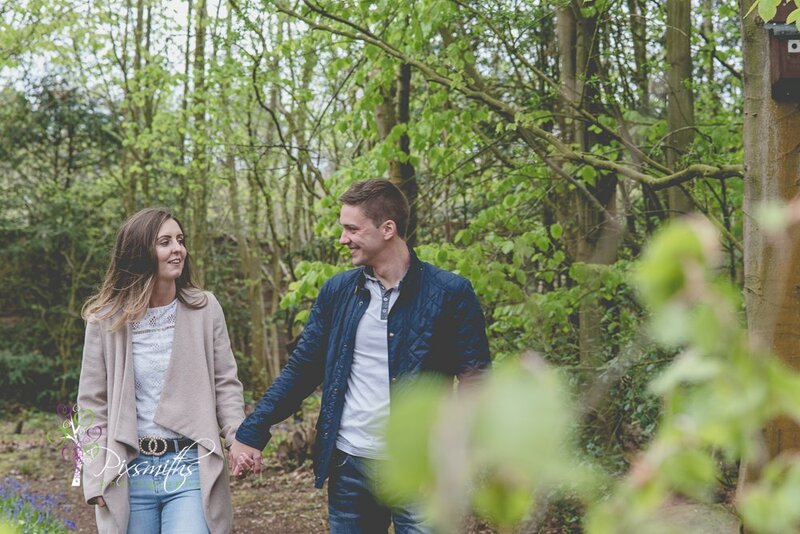 We are really looking forward to capturing their upcoming summer wedding at Leverhulme Hotel and working with some amazing suppliers. 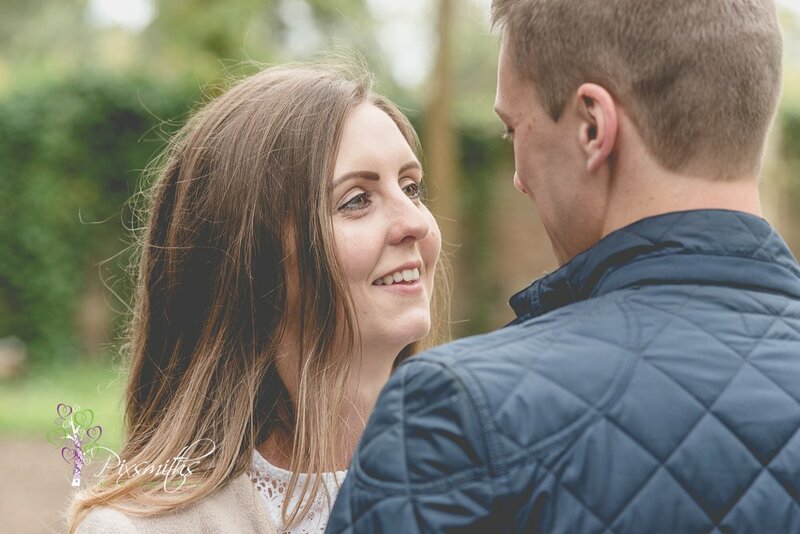 Pixsmiths don’t just do engagement shoots we also enjoy couple shoot . 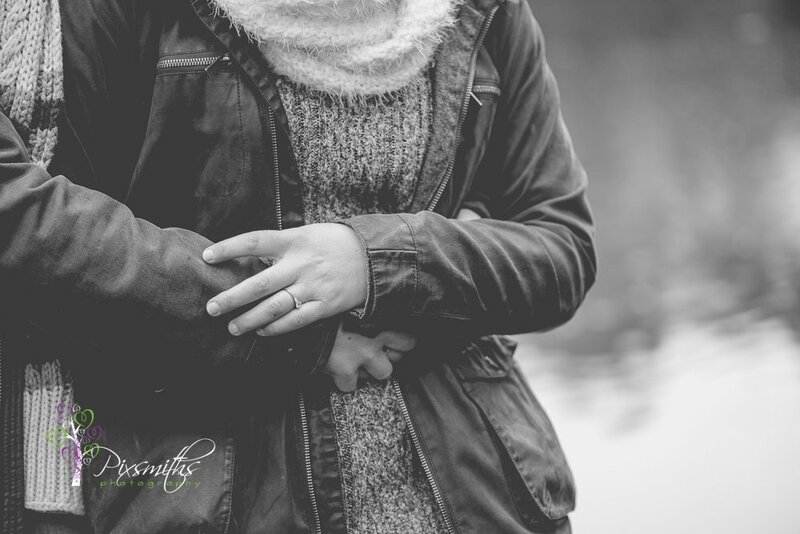 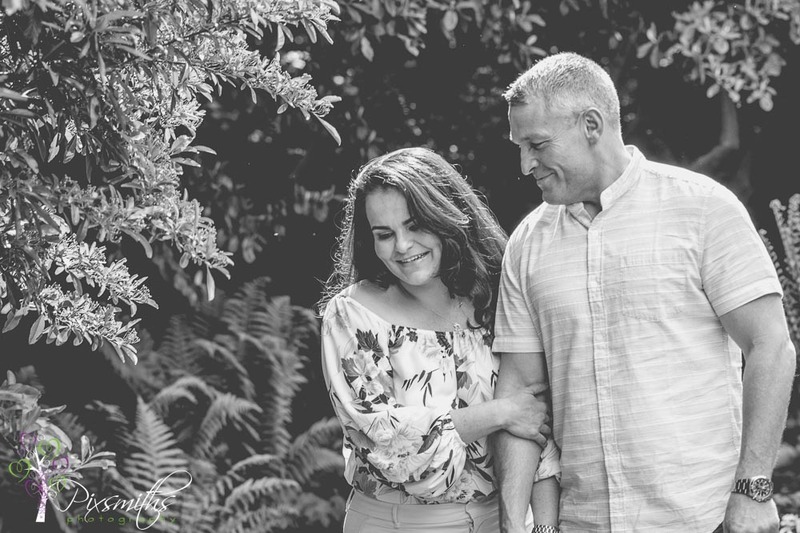 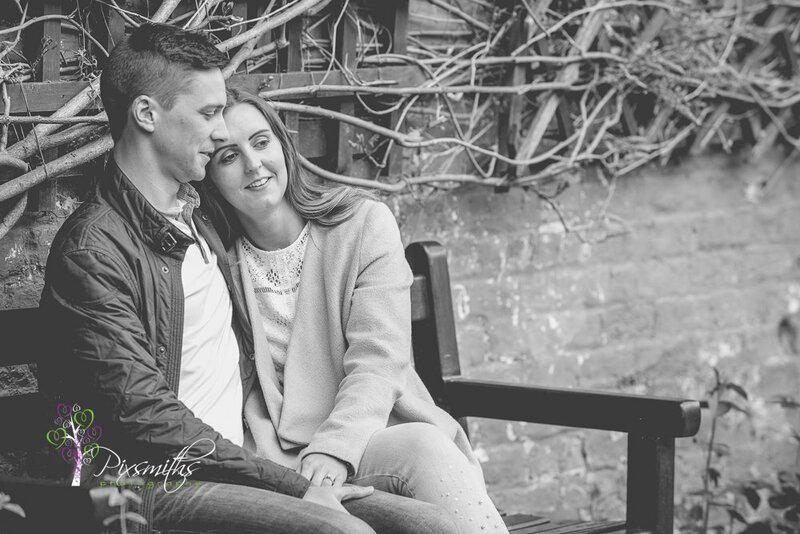 We just love shooting any couples in love whether engaged to be married or married already. 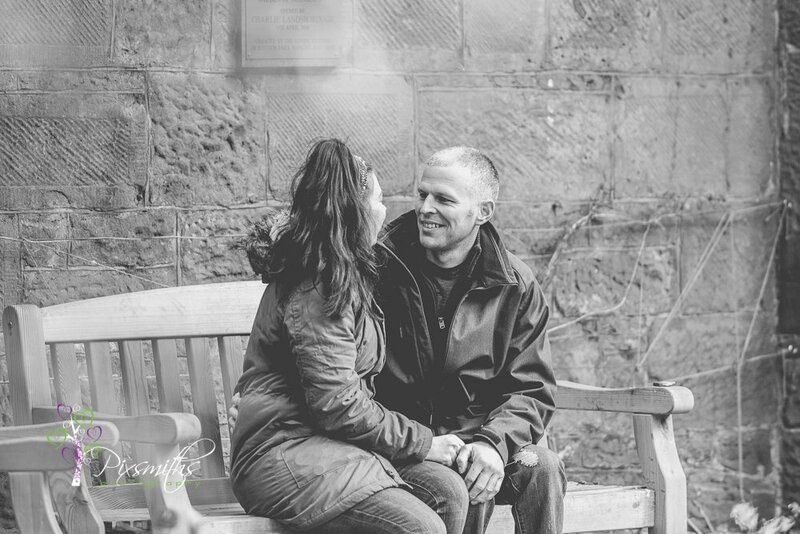 Indeed we have previously shot anniversary shoots as a celebration of love. 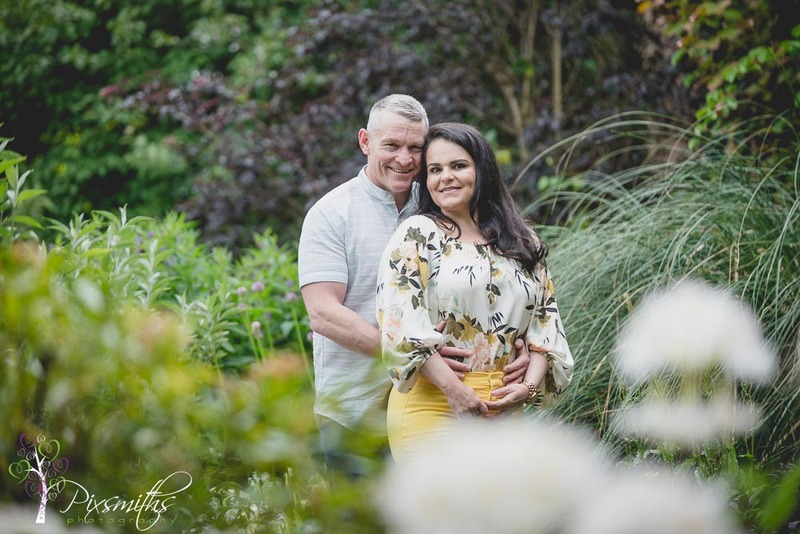 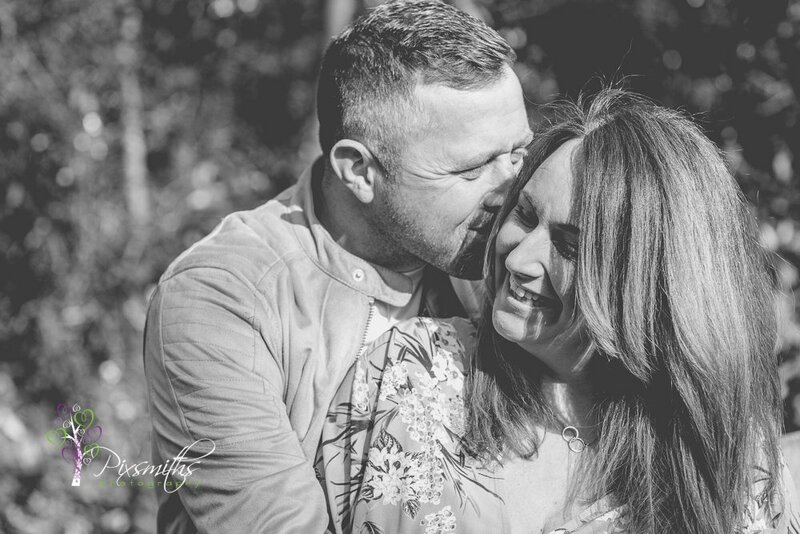 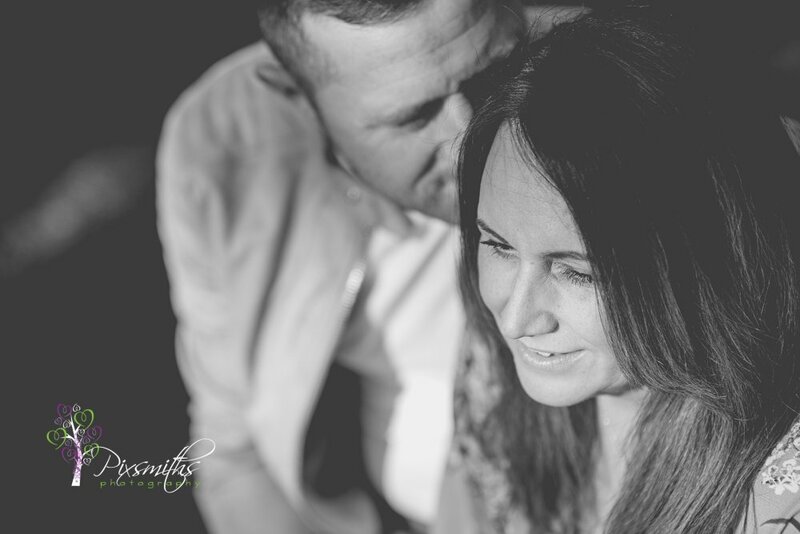 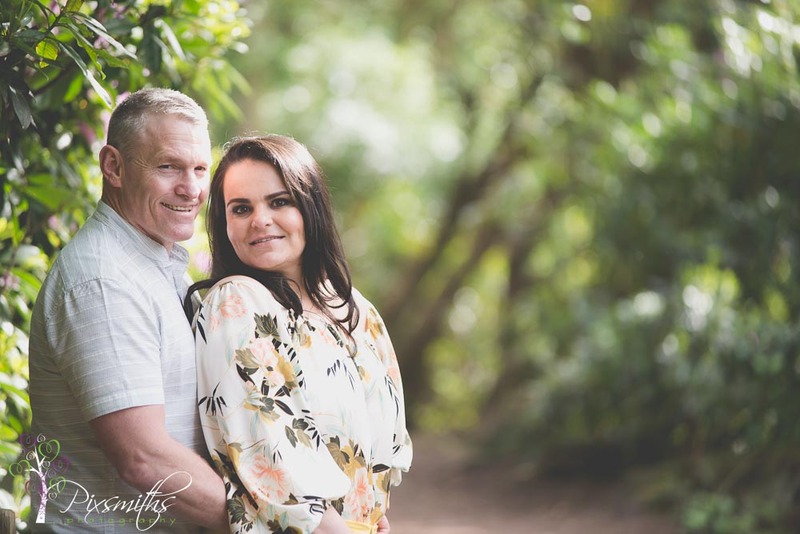 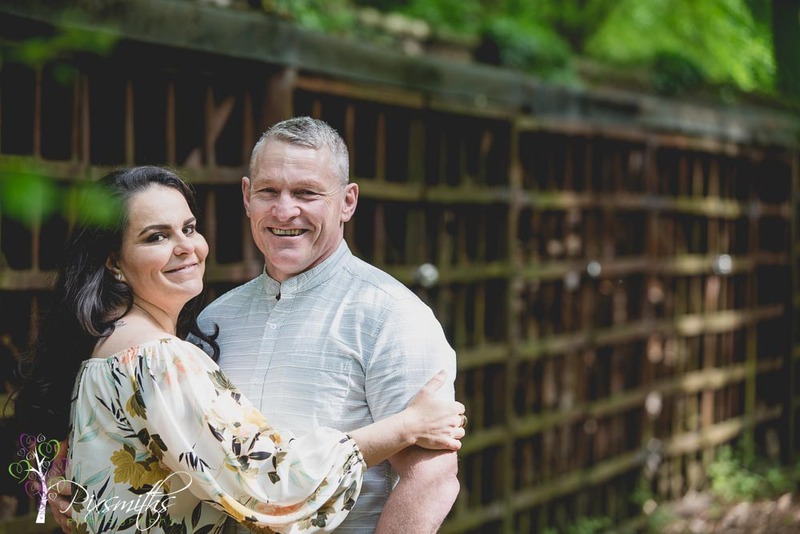 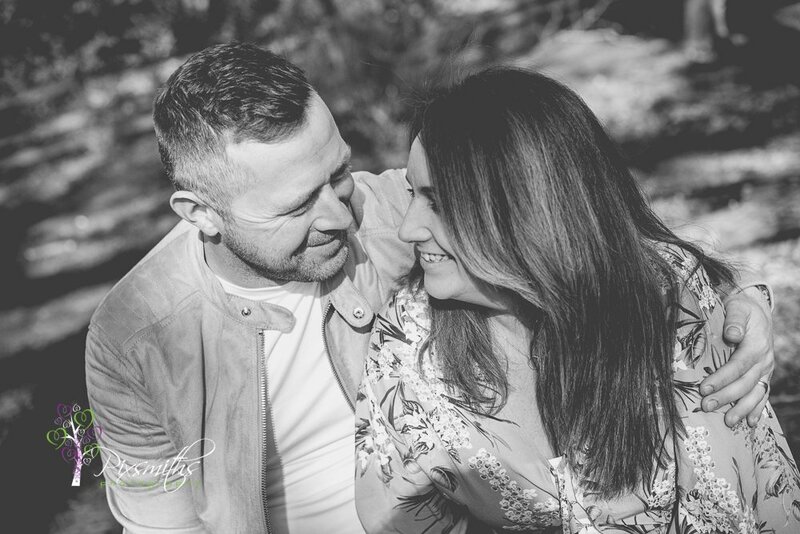 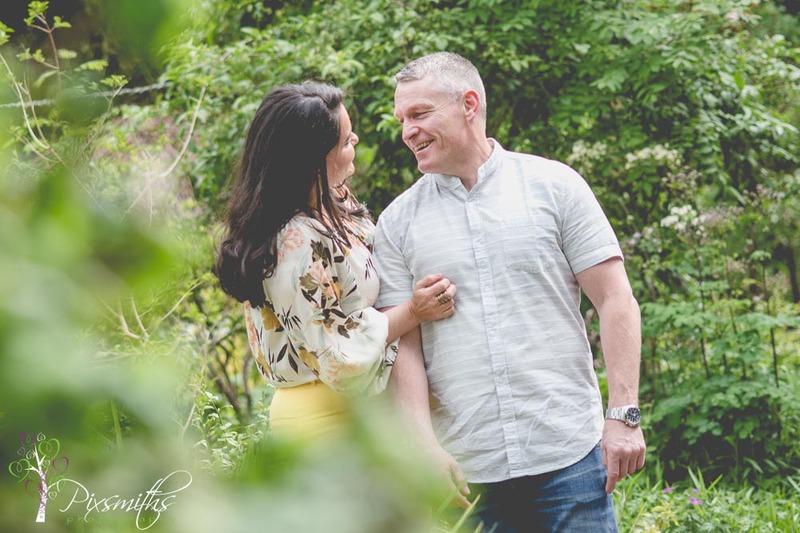 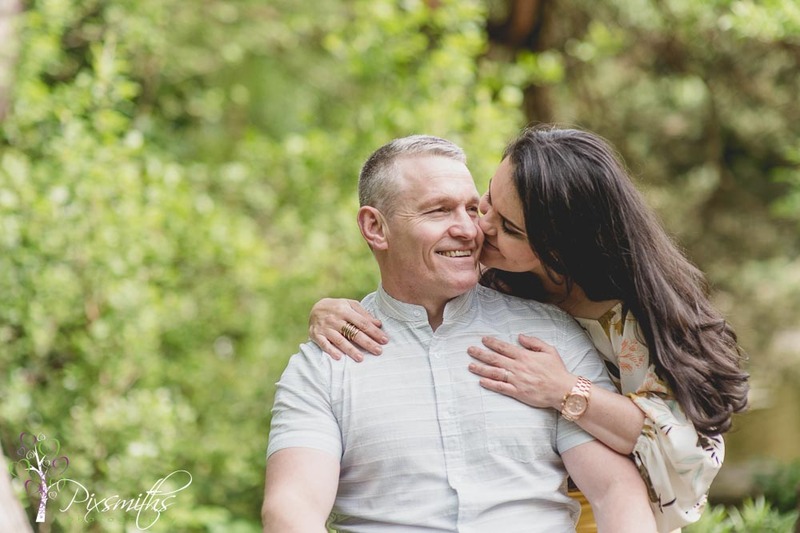 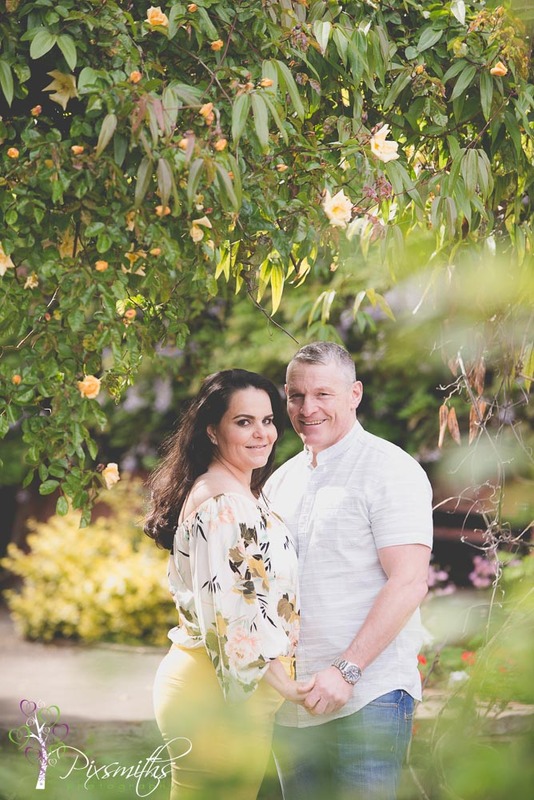 We were so happy to capture some gorgeous shots for Claire and Simon, happily married for several years now. 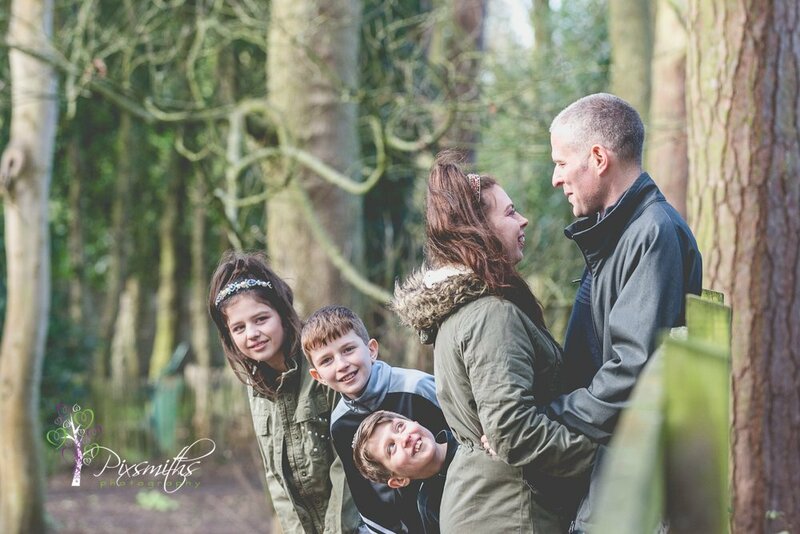 Claire is a fellow wedding supplier, a lovely mobile hair dresser and super mum to Evie. 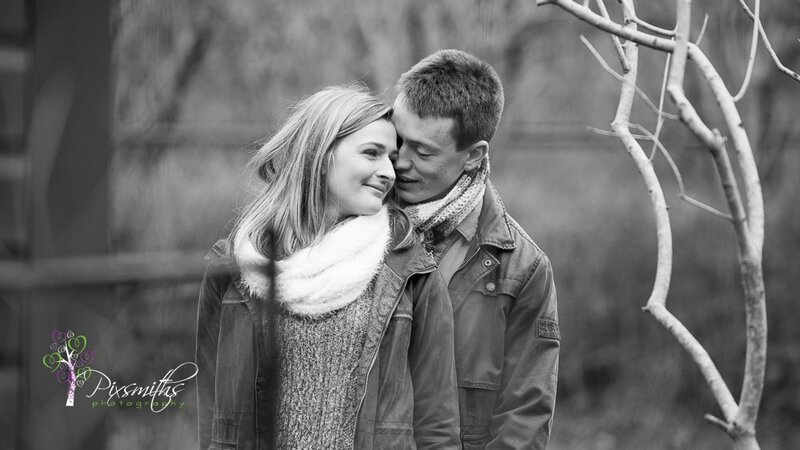 Simon’s work takes him away from work for long periods and its true when they say “absence makes the heart grow fonder”. 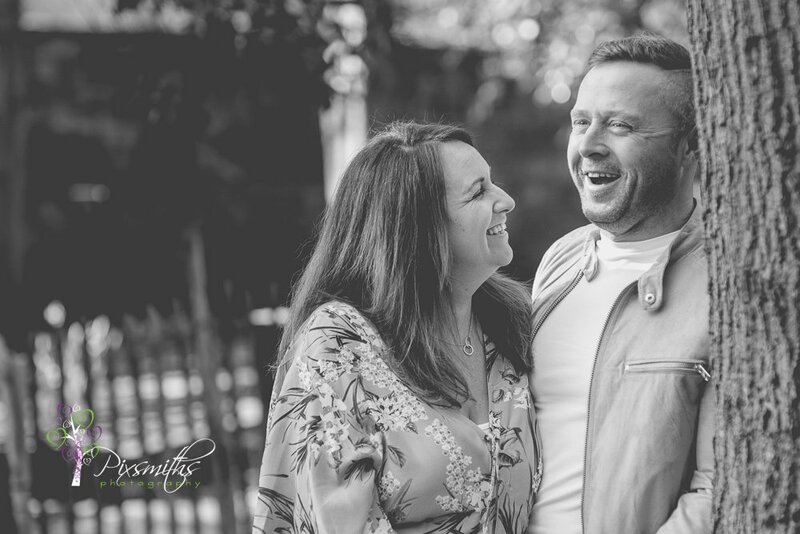 Claire and Simon can certainly testify to that! 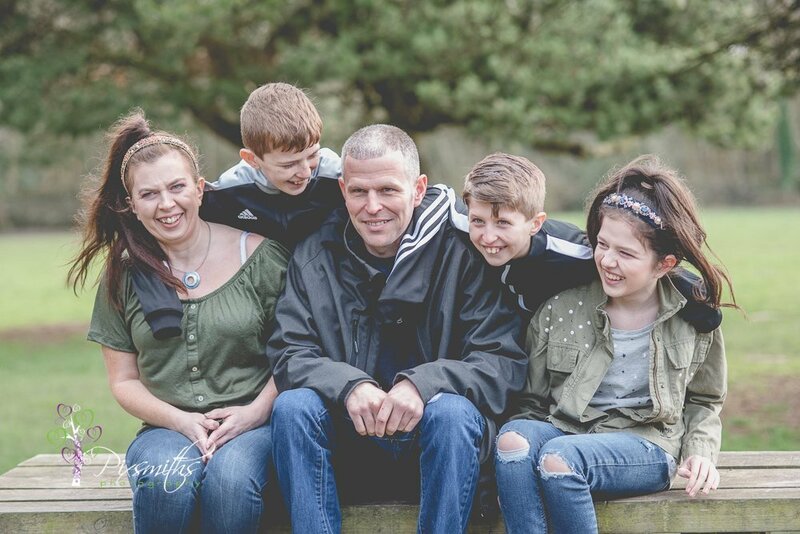 Simon went of to sea just before Christmas and has only just recently returned. 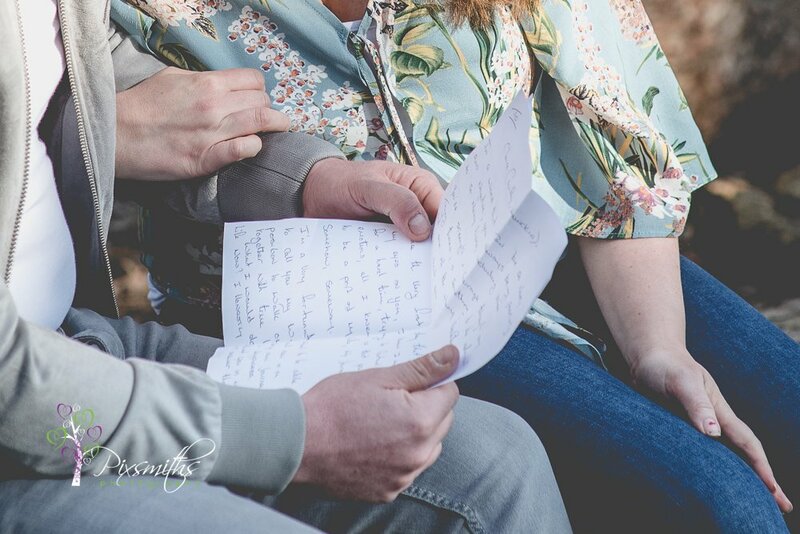 but in the meantime they were to write down how much they were missing each other ..and bring these letters with them to read. 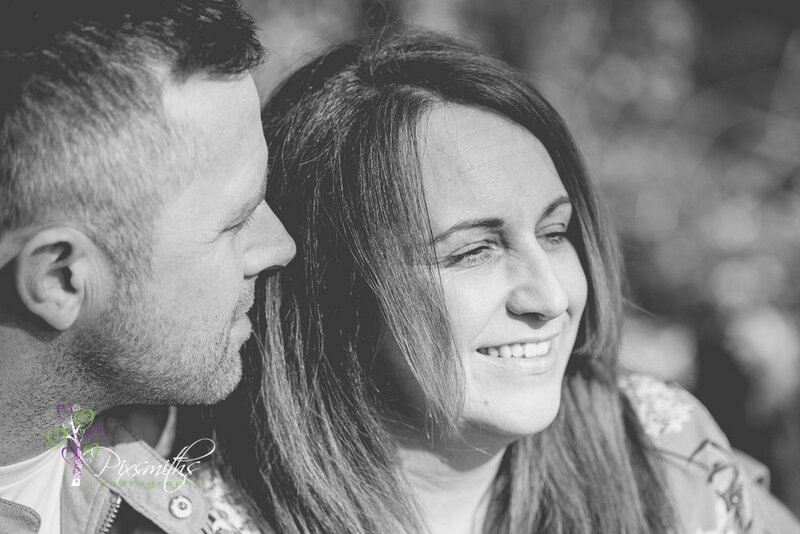 the momentum was buildign when Claire did a live facebook video as she waited (ages) for him at the airport. 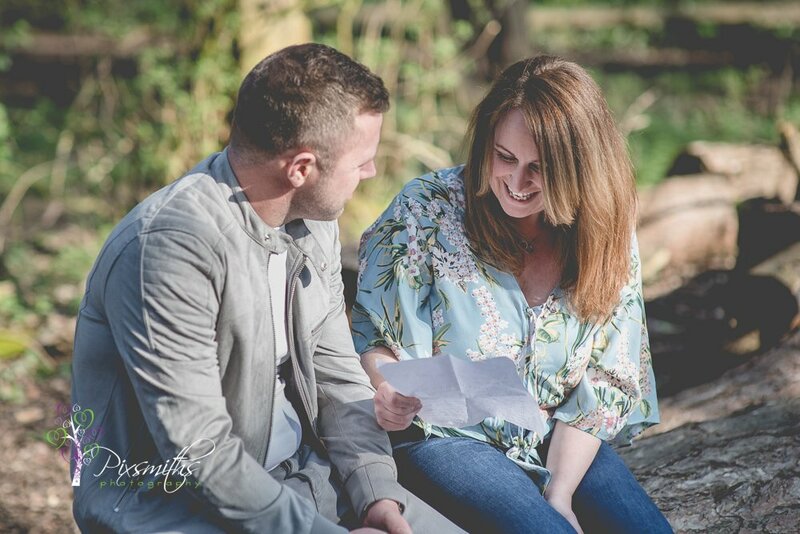 Neither had seen each others letters before the shoot. 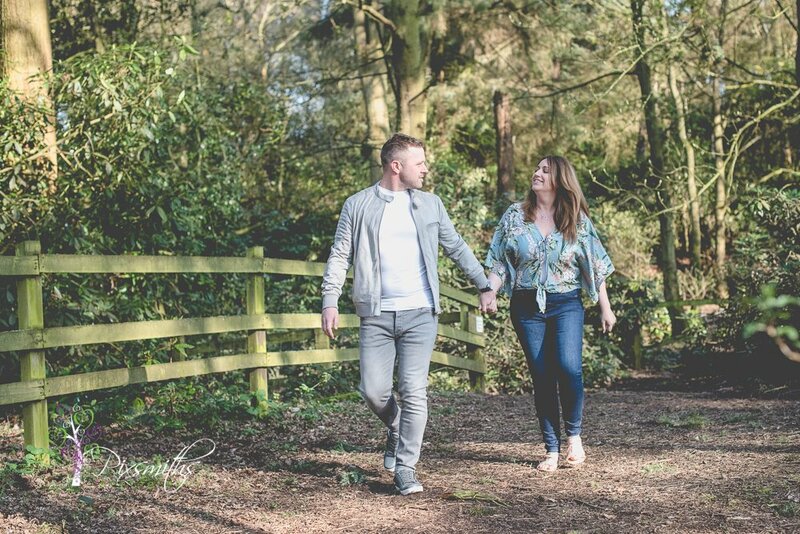 so the stage was set, a sunny afternoon in Royden Park last weekend. 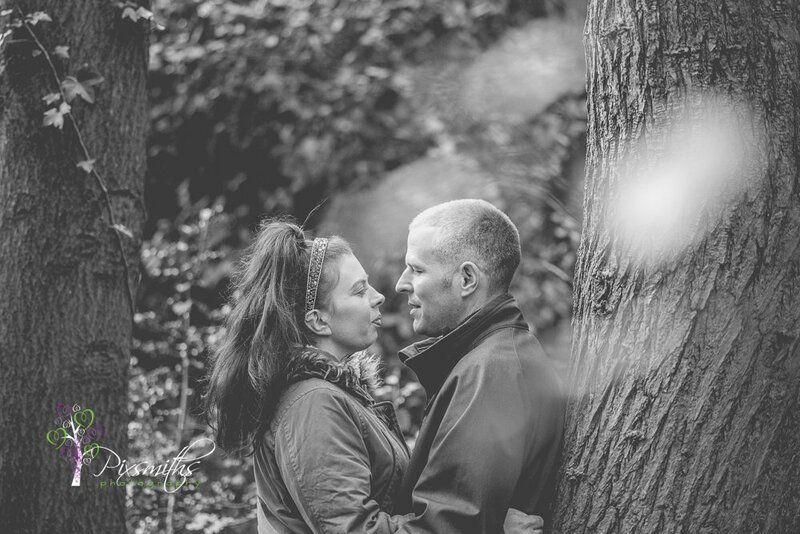 Well it was truly heartwarming and an honour to capture such a personal moment. 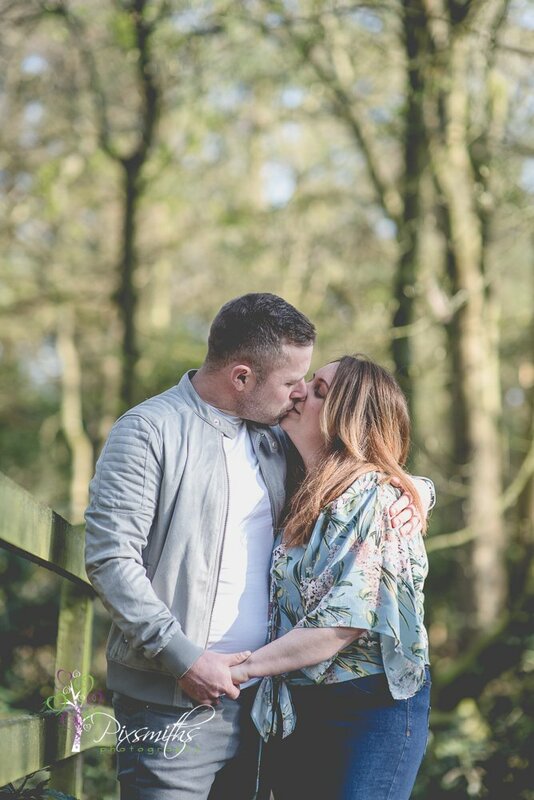 this is what Claire had to say, “honestly I have to say it was so special ❤️ One of the most beautiful ways of showing our love for each other was made today . 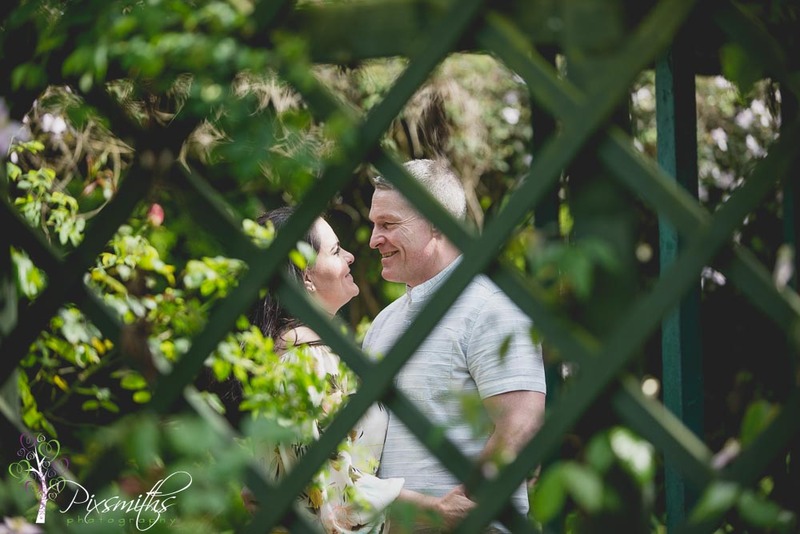 Simon said, he felt quite emotional afterwards, “it was like saying our vows again”. 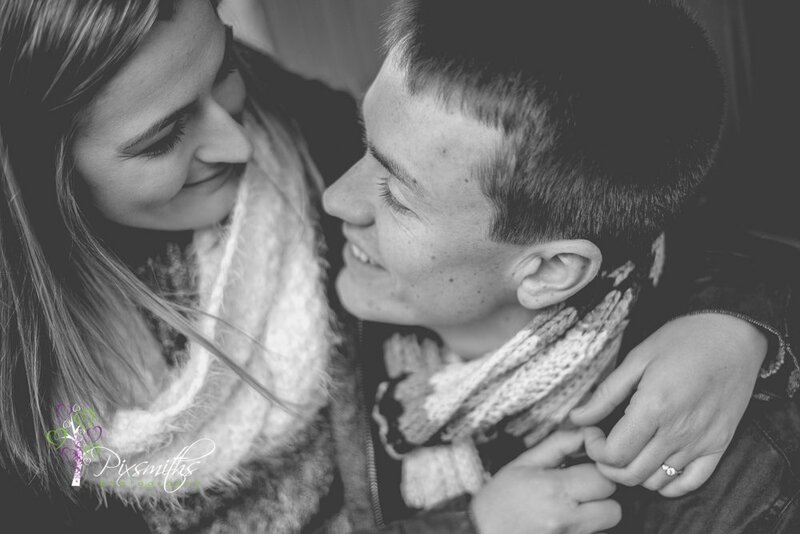 There were hugs and kisses and lots of laughter! 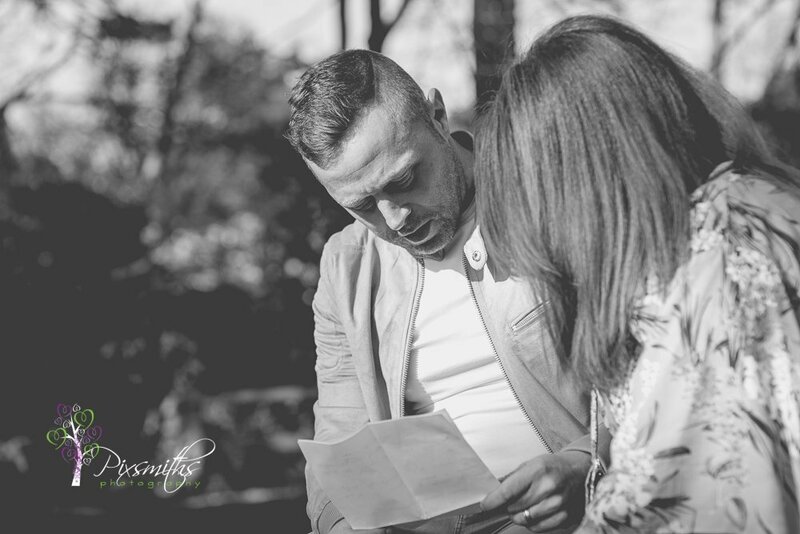 It truly gladdened our hearts to do this shoot, its really good to give back and see the sincere appreciation of such lovely deserving couples. 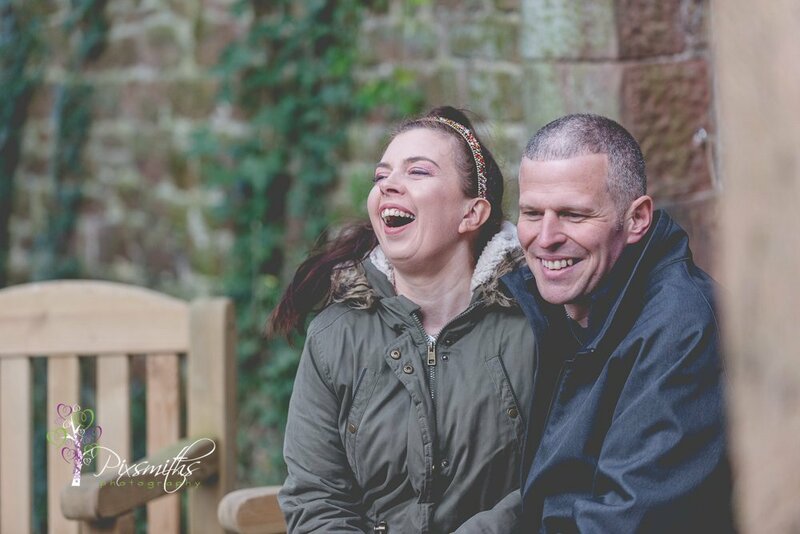 We all had beaming smiles. 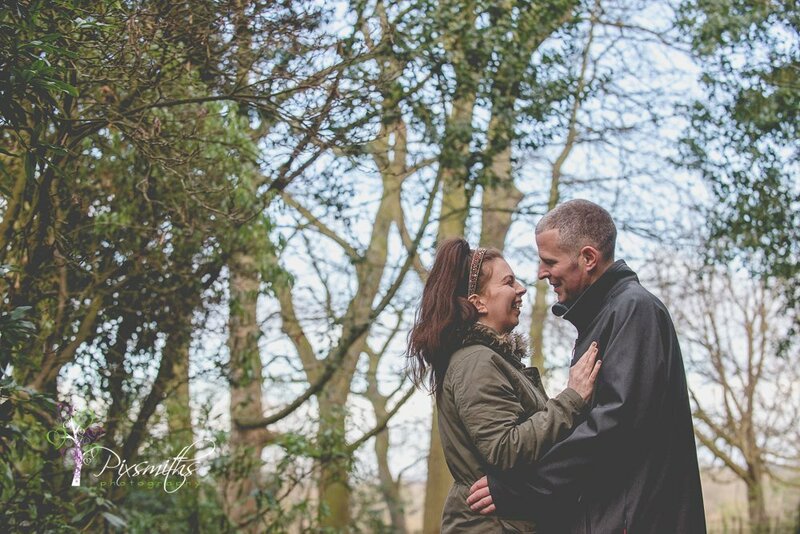 Thank you so much again Claire and Simon for allowing us to capture this special time with you. 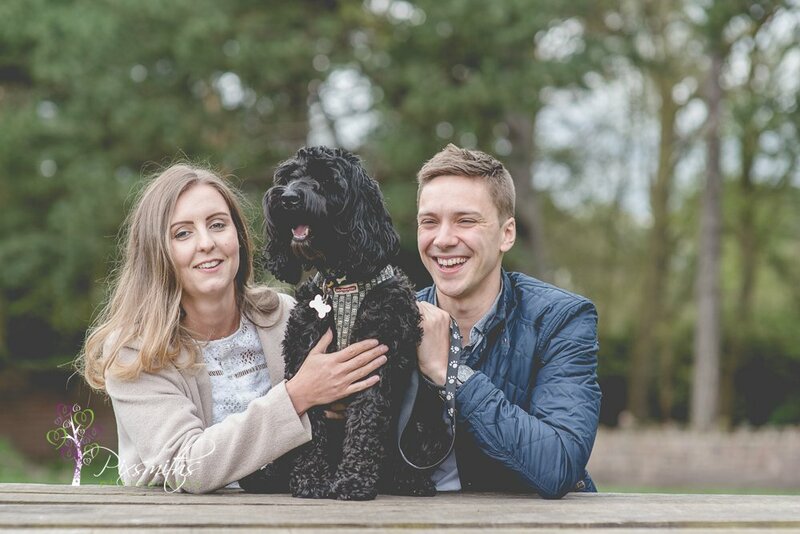 Of course we sneaked a few shots with Evie too, she love to pose for the camera – she can often be seen modelling bridesmaids dresses on a wedding show catwalk too! 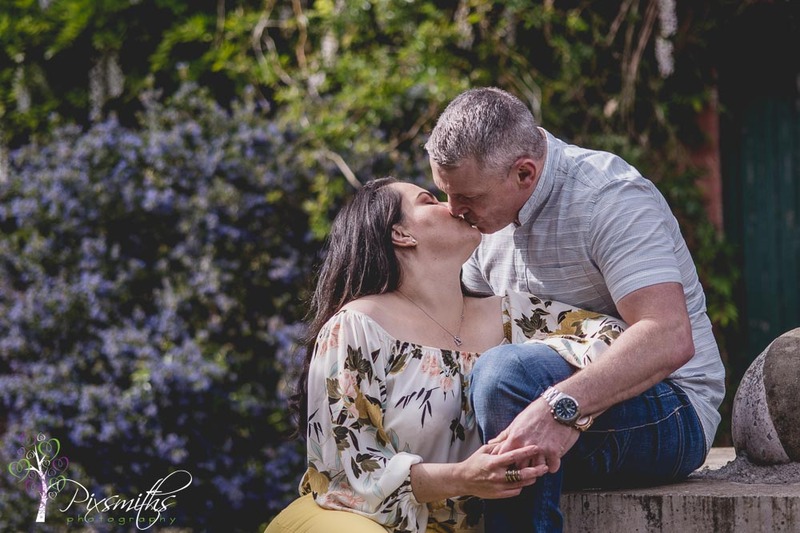 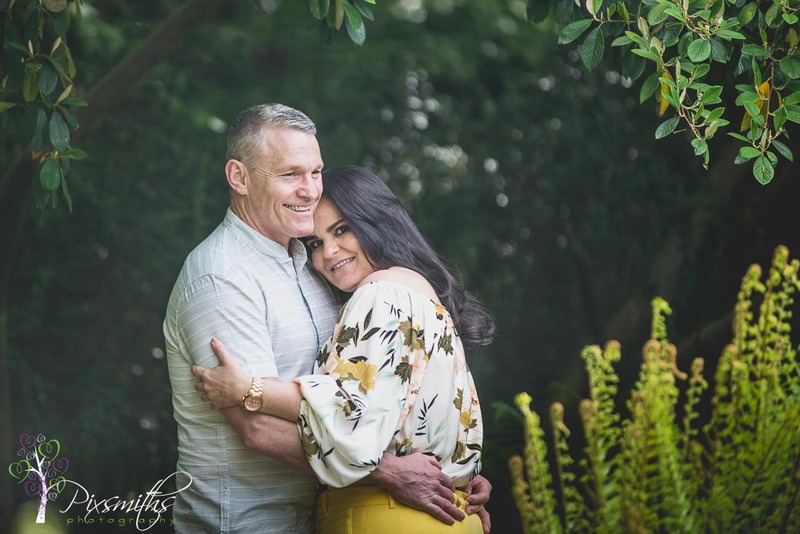 So couple shoots are not just a way to get to know a photographer but a chance to celebrate your love and enjoy something special and making memories. 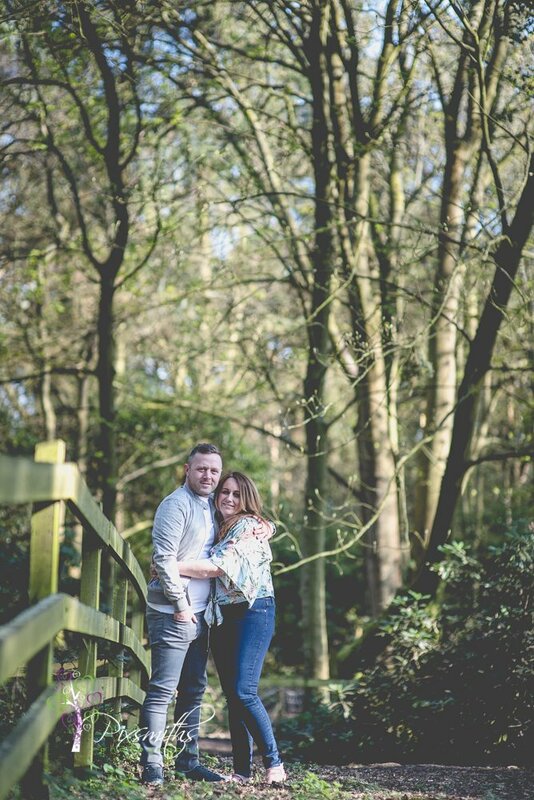 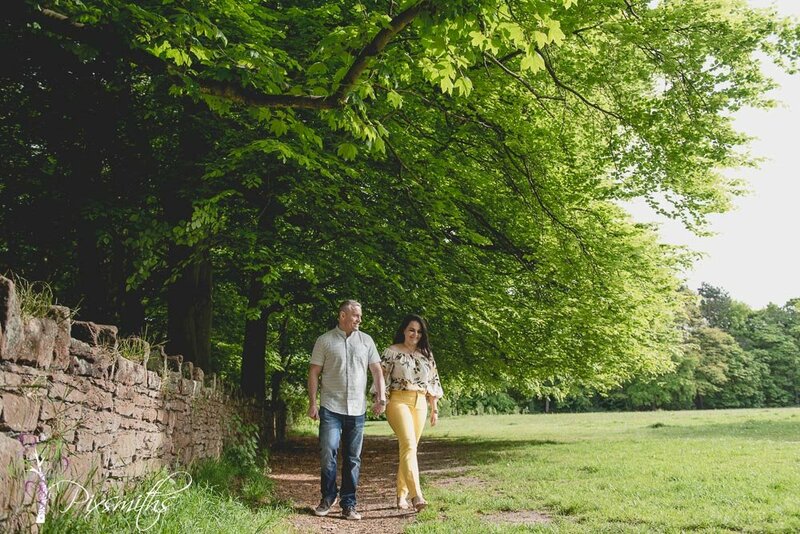 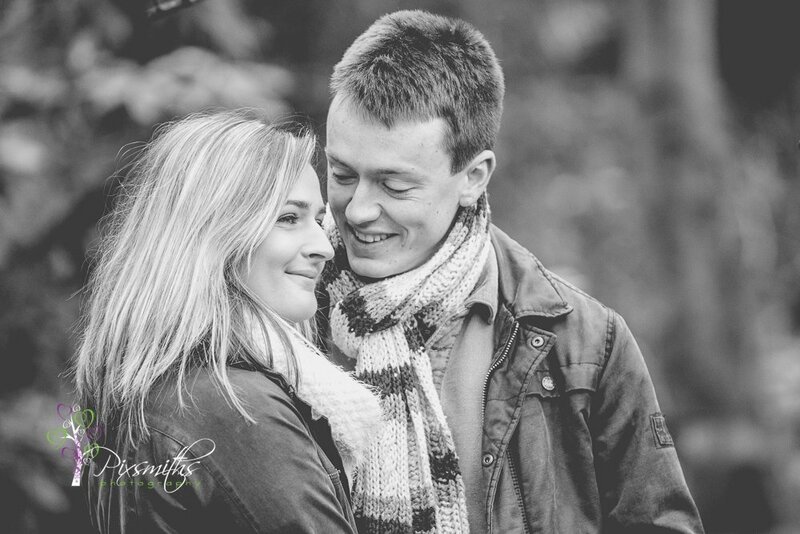 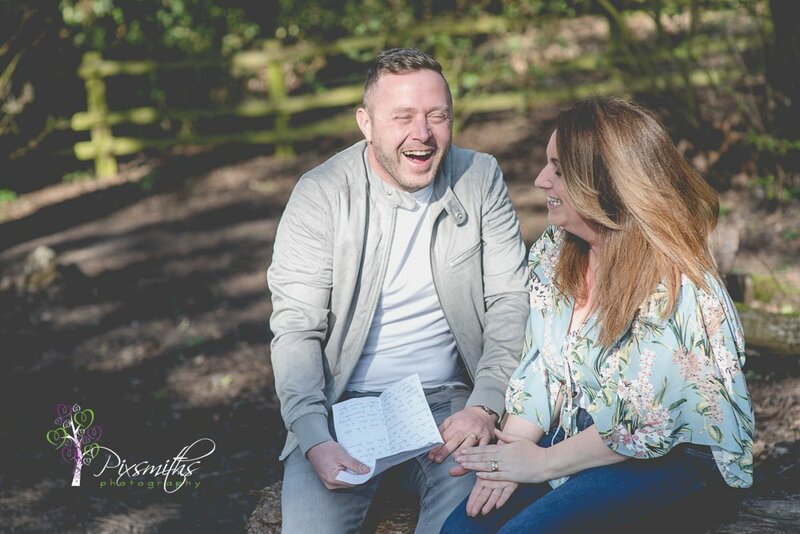 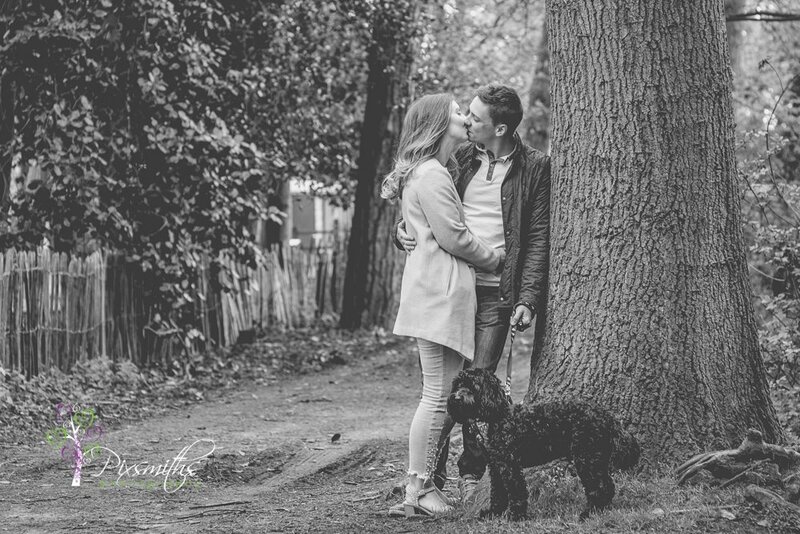 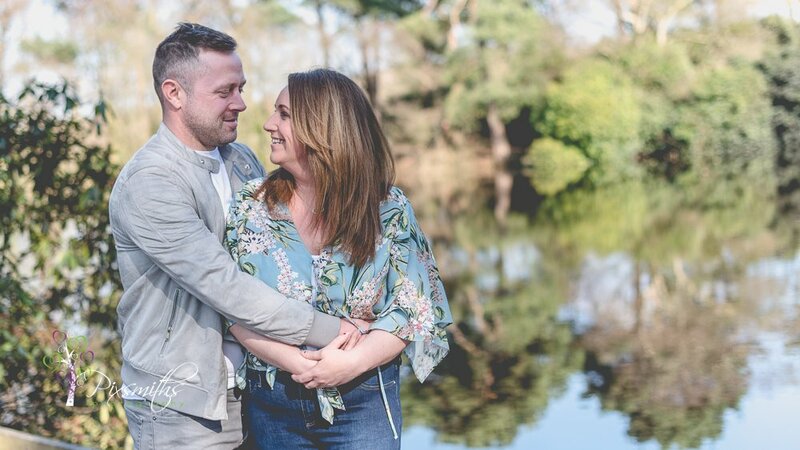 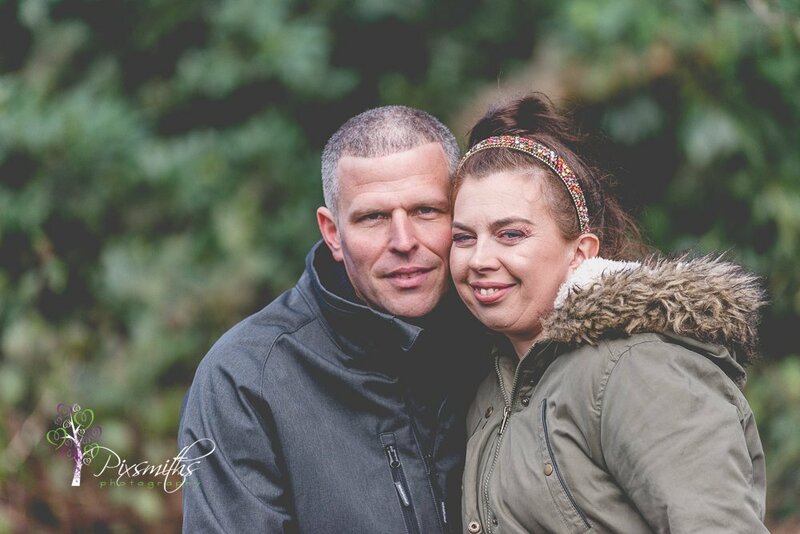 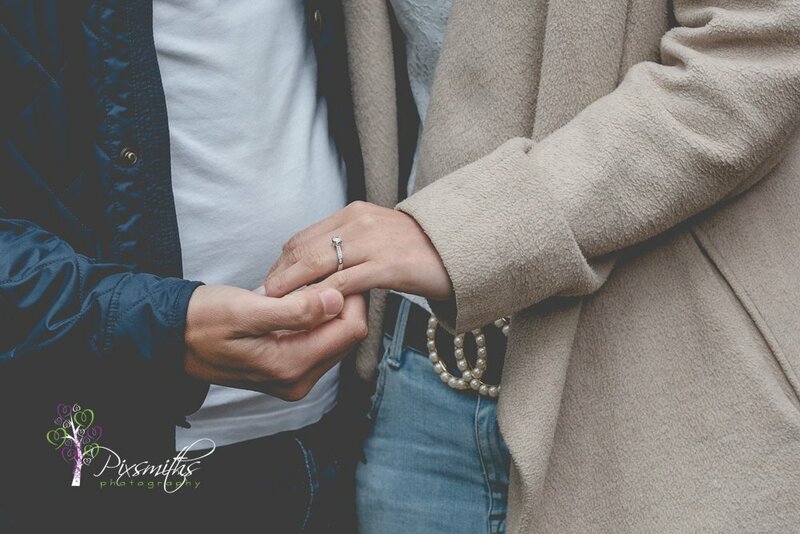 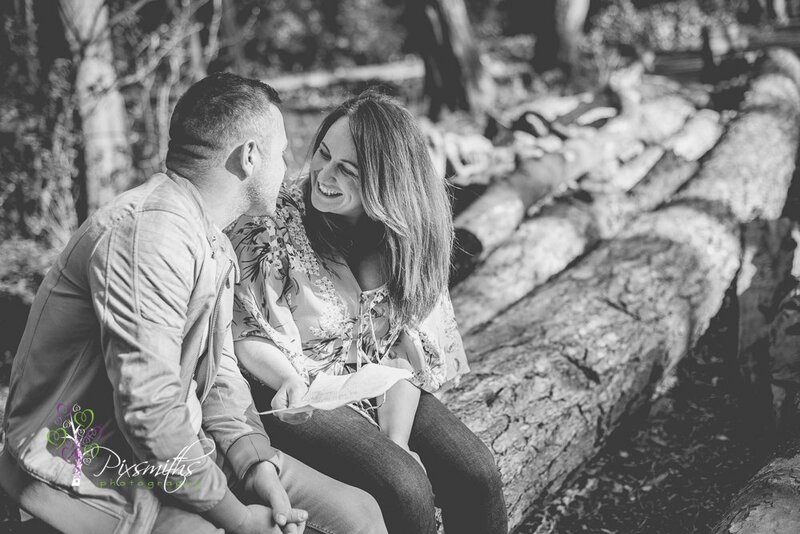 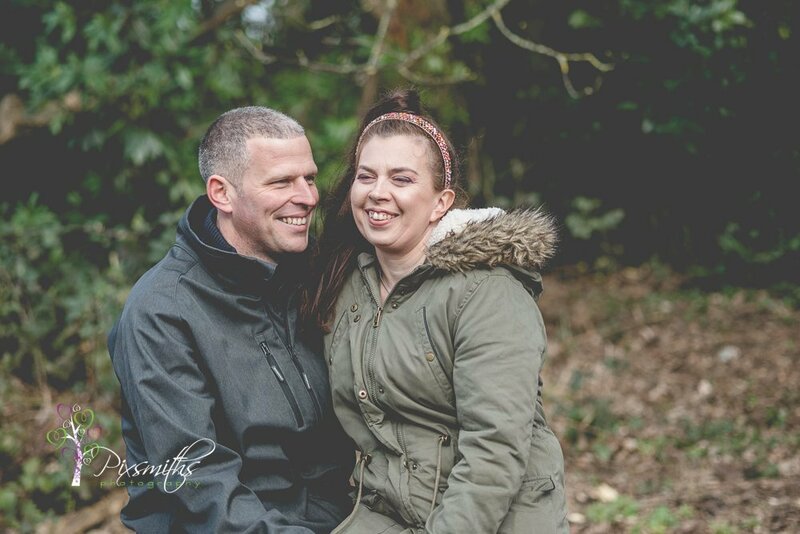 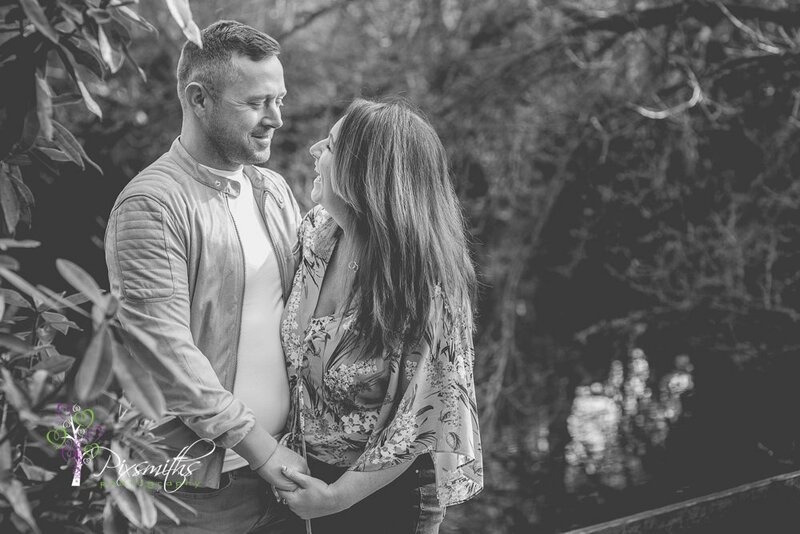 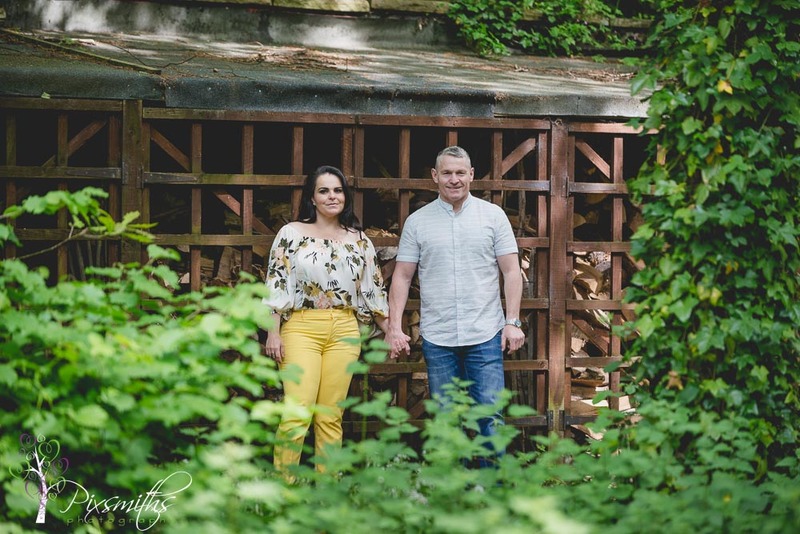 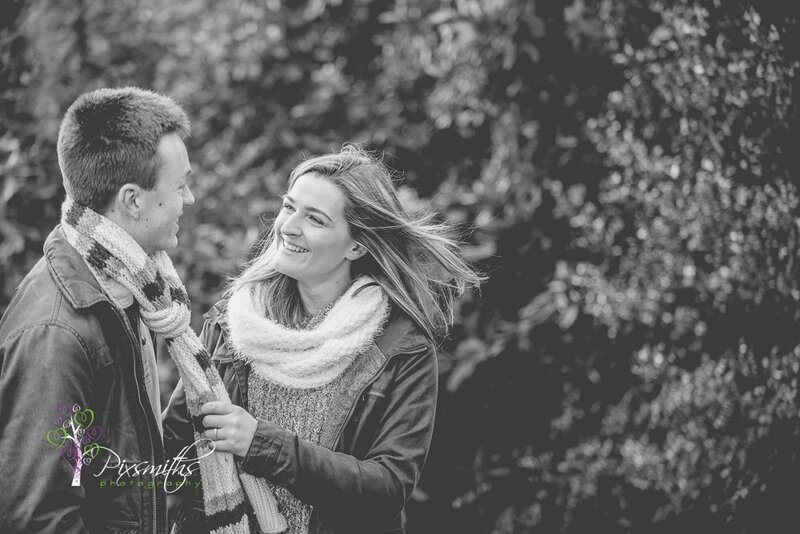 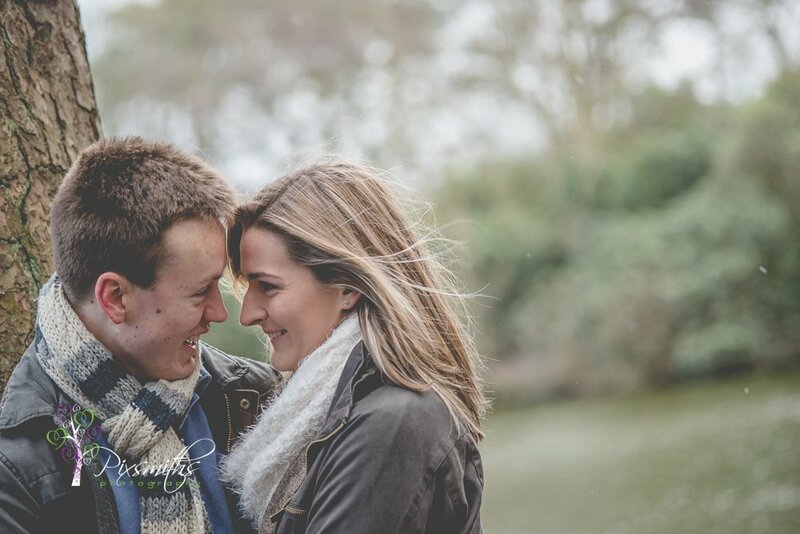 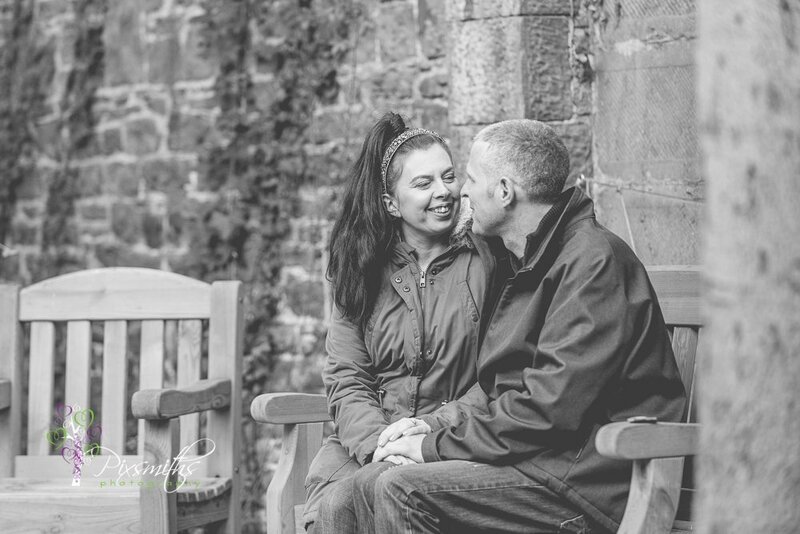 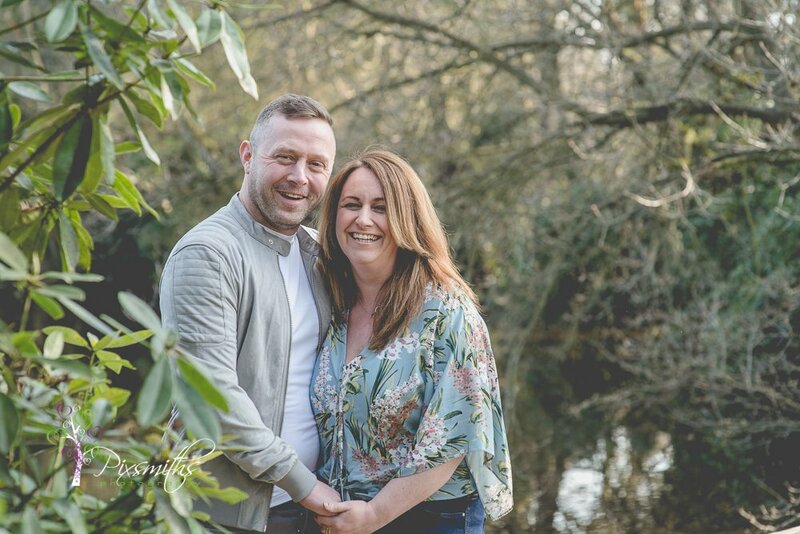 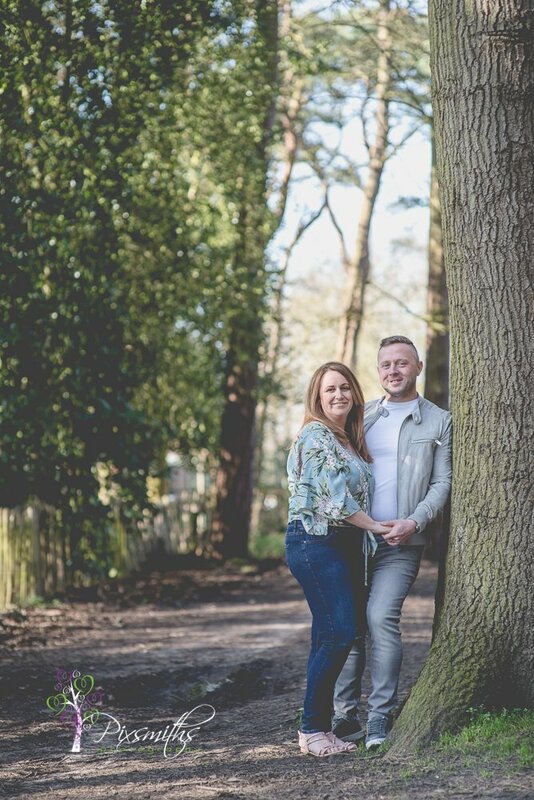 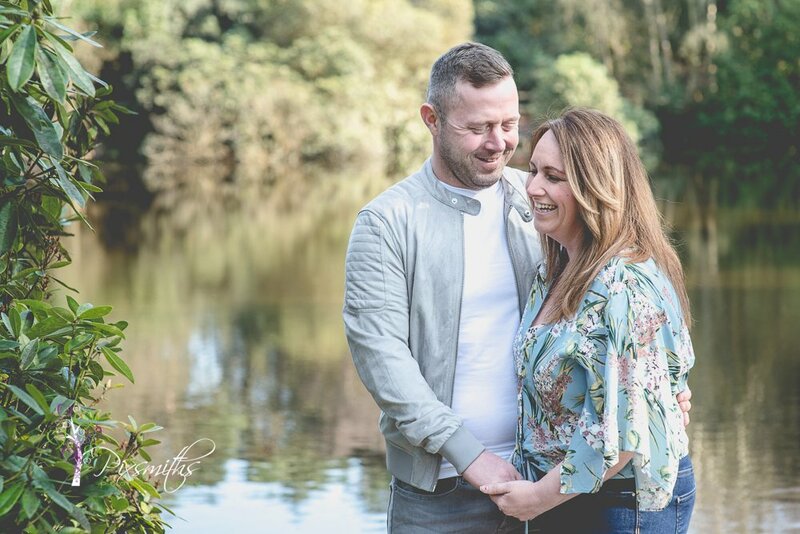 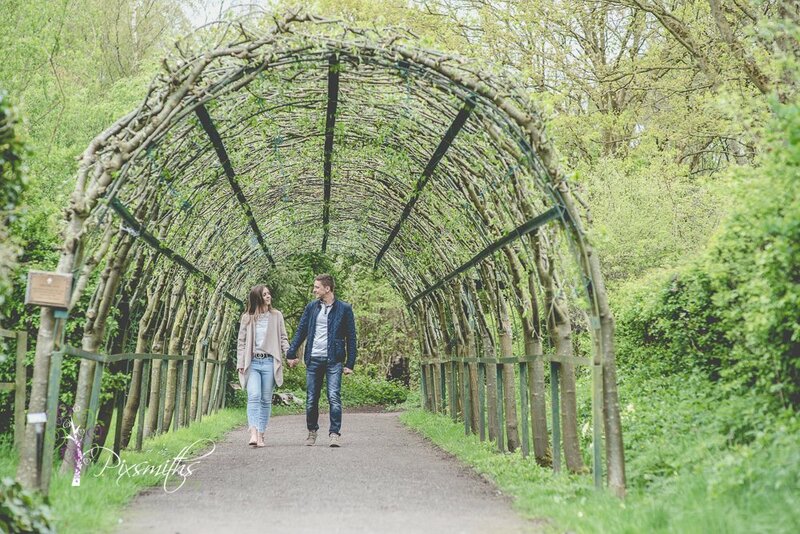 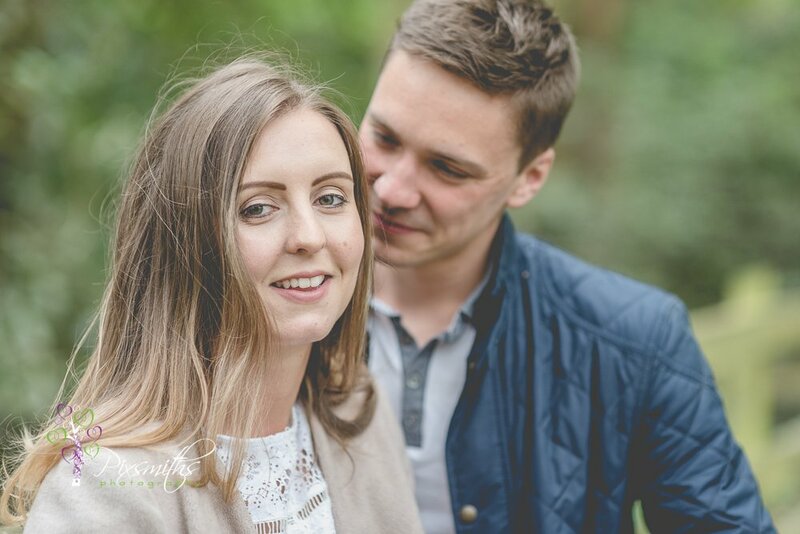 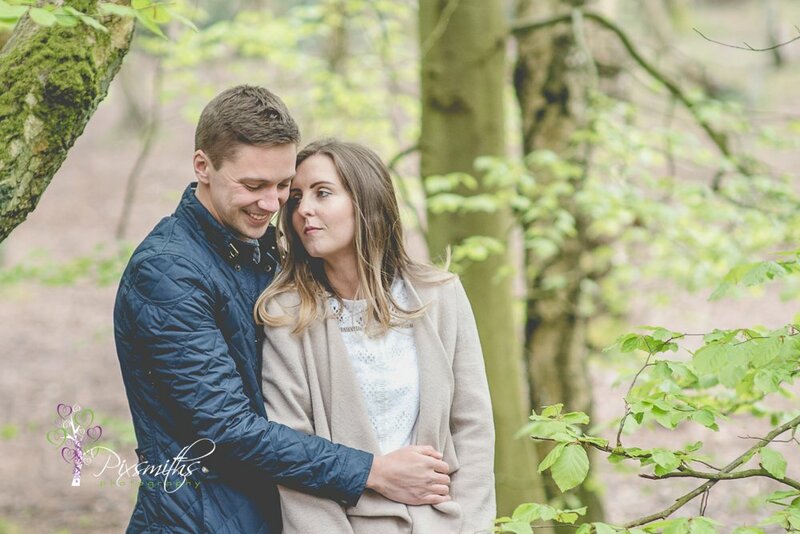 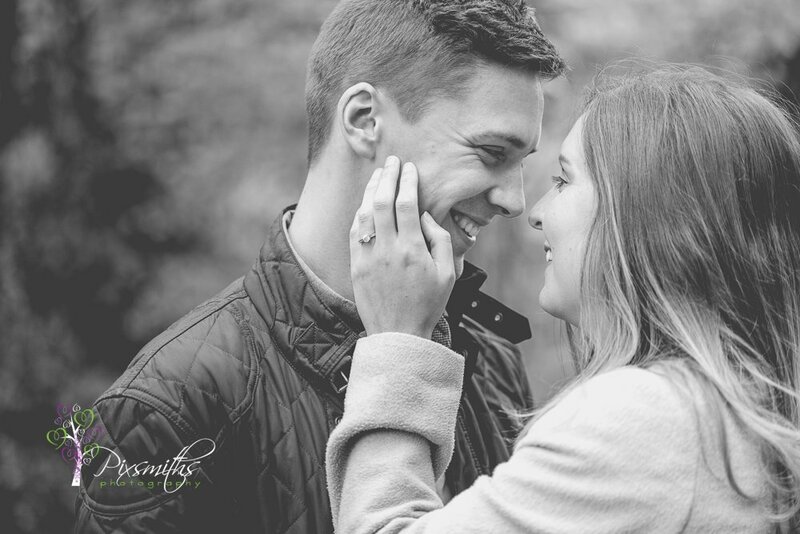 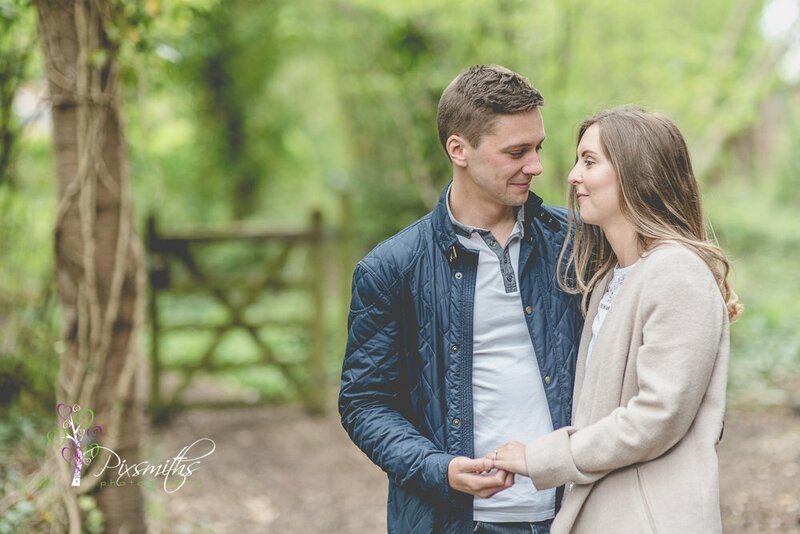 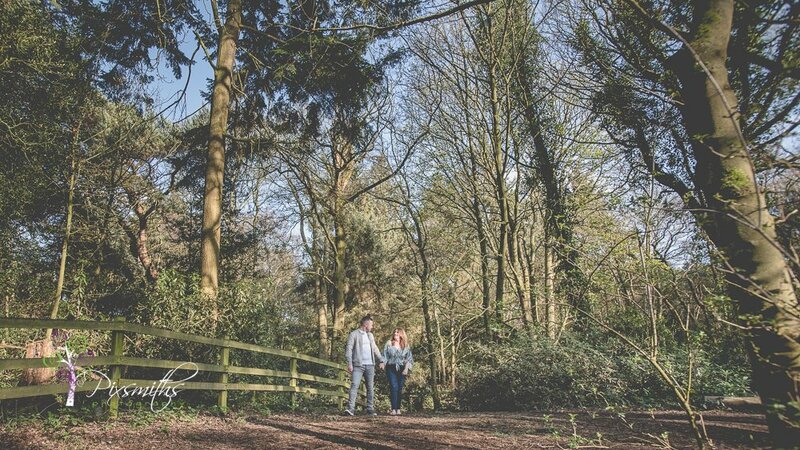 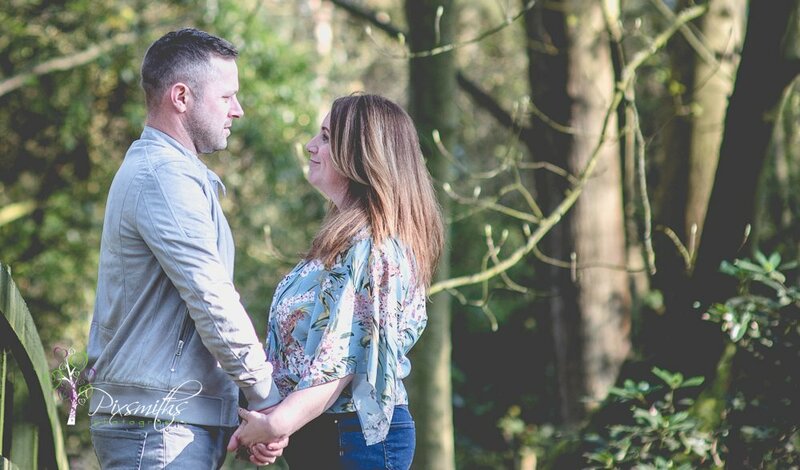 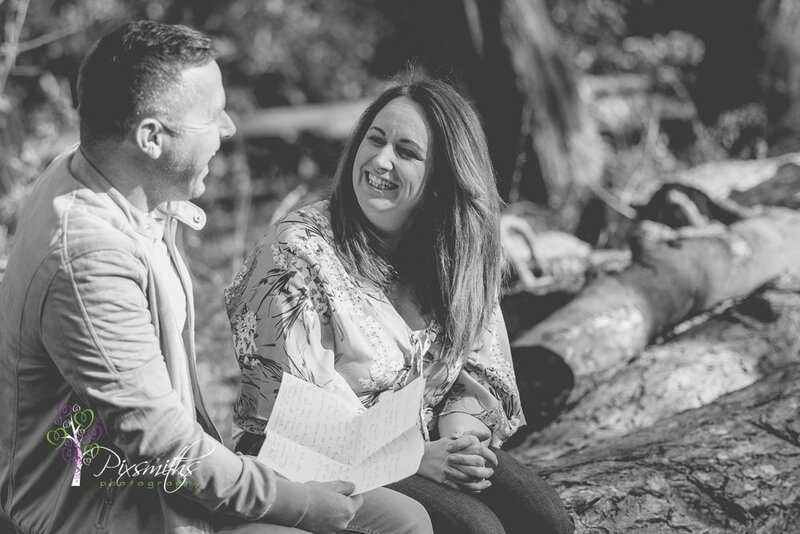 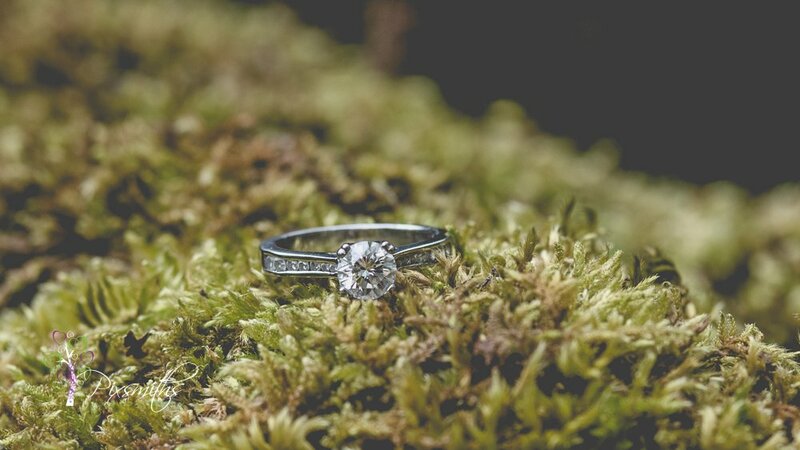 Delighted Claire and Nathan chose to have a Wirral country park engagement Shoot with Pixsmiths. 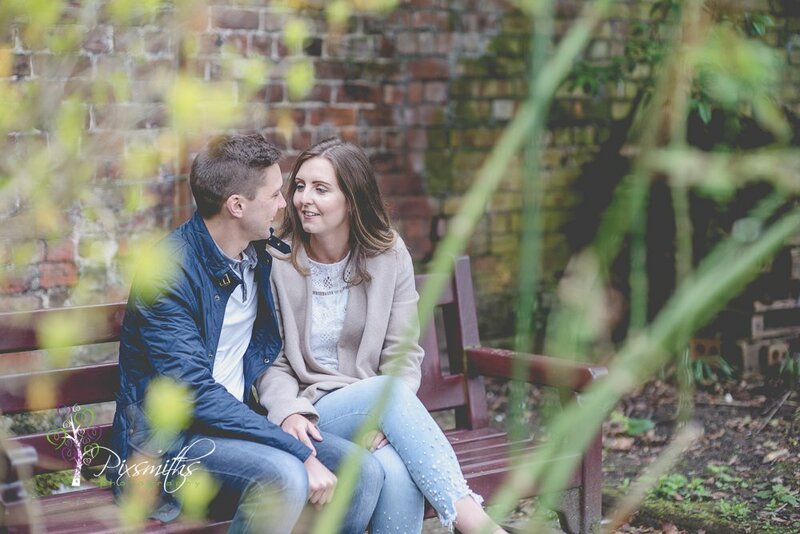 Claire and Nathan are having a spring wedding in May so always a good idea to have a an engagement shoot in a different season. 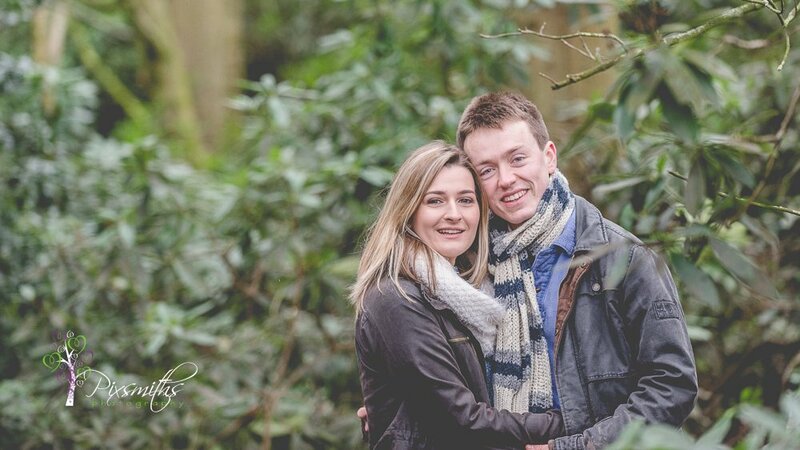 In fact Claire and Nathan’s wedding will be the alternative to the Royal wedding of Prince Harry and Meghan! 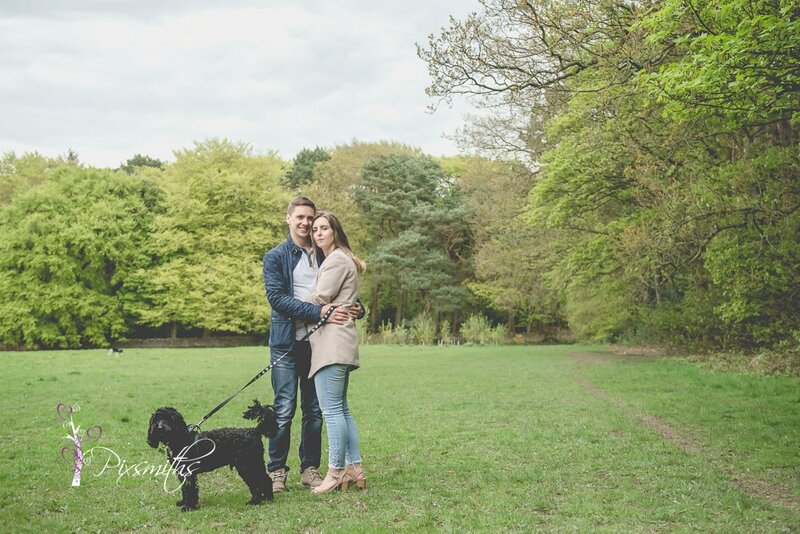 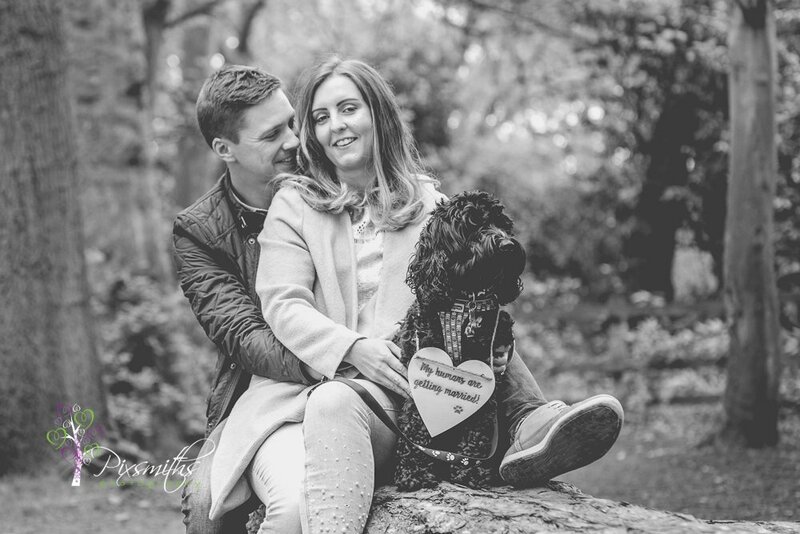 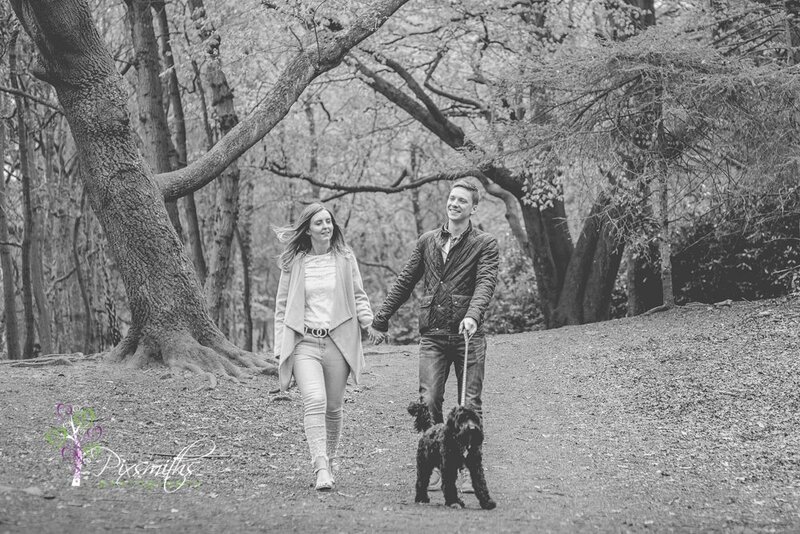 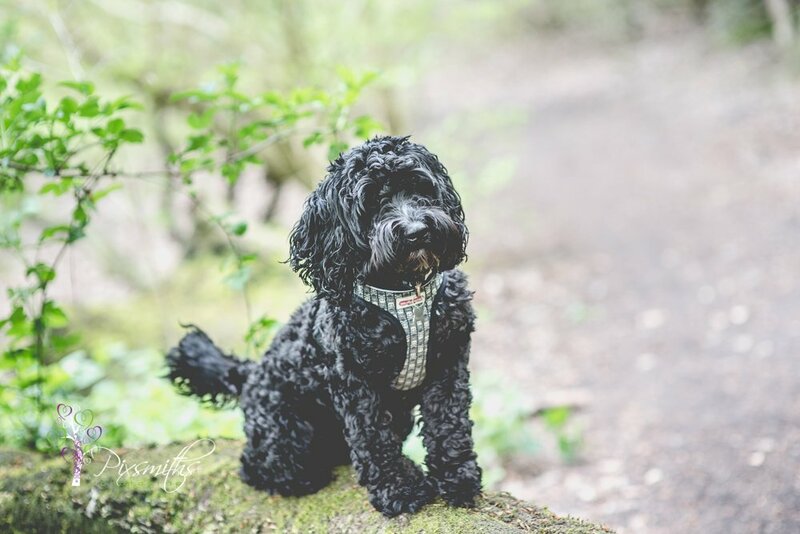 For their Wirral country park engagement shoot Walter their one year old dog came along – how gorgeous is he with his silky floppy ears. 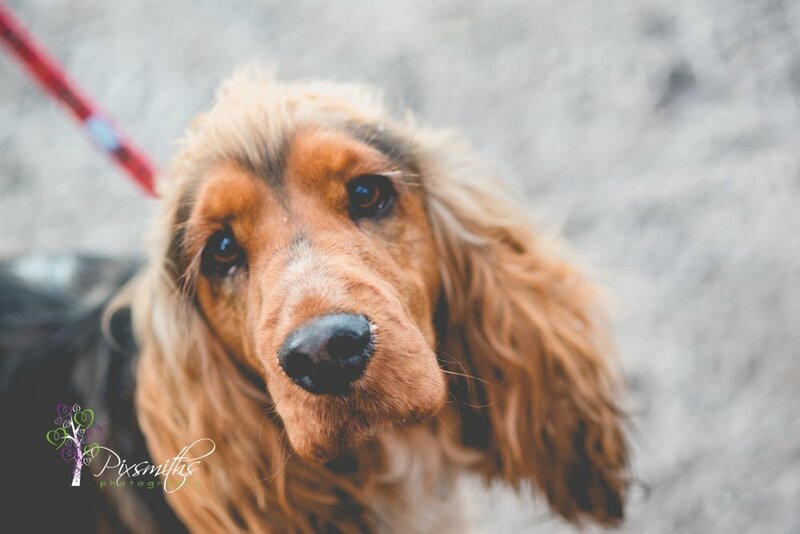 He almost stole the show! 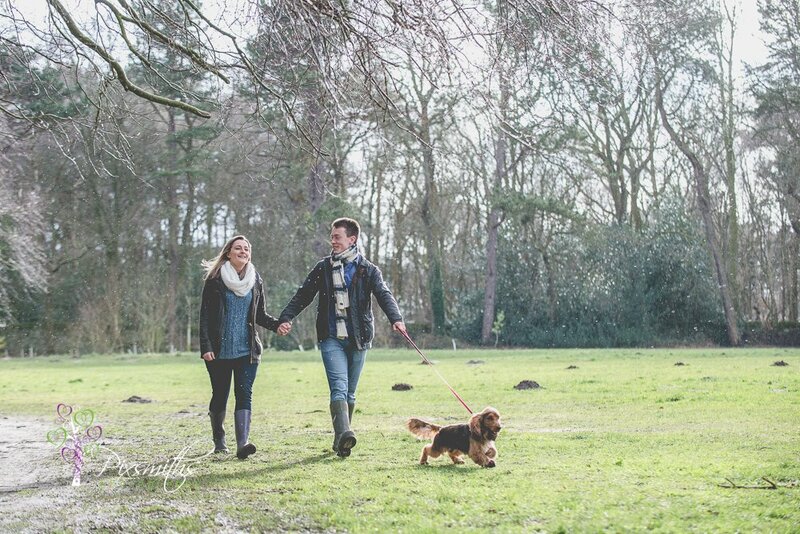 We managed to dodge the heavy rain showers that happened during the morning, which did make the ground a bit muddy! 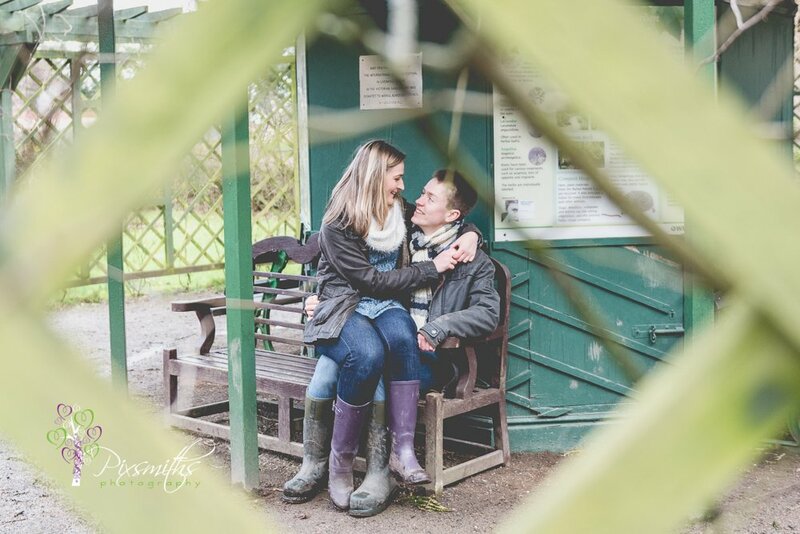 Claire and Nathan were well prepared for this by wearing wellies. 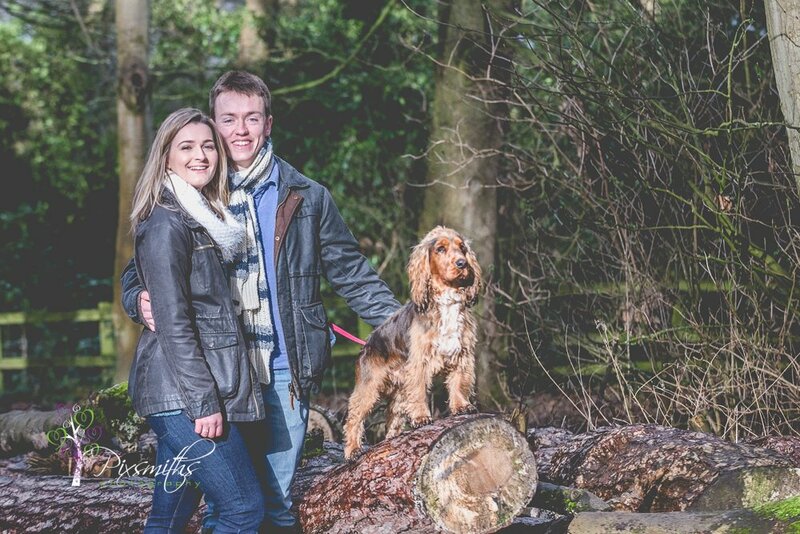 Didn’t stop muddy paws jumping up on jeans though! 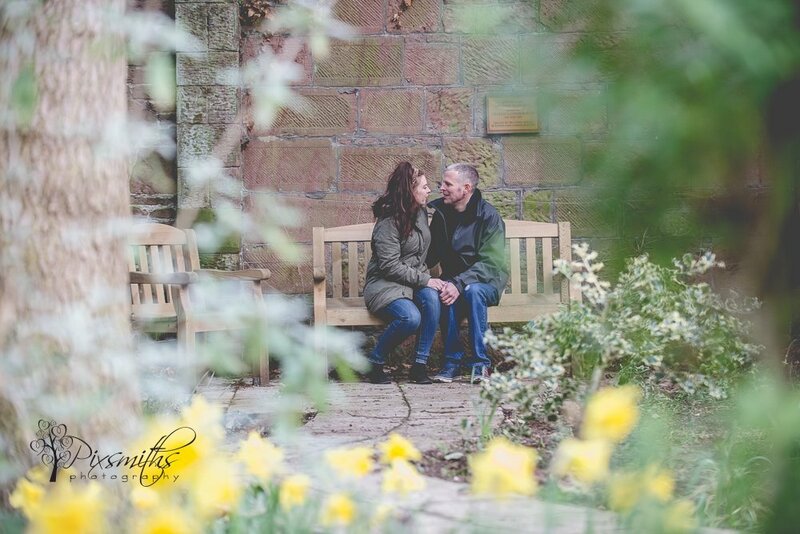 The walled garden provided a bit more shelter from wind too. 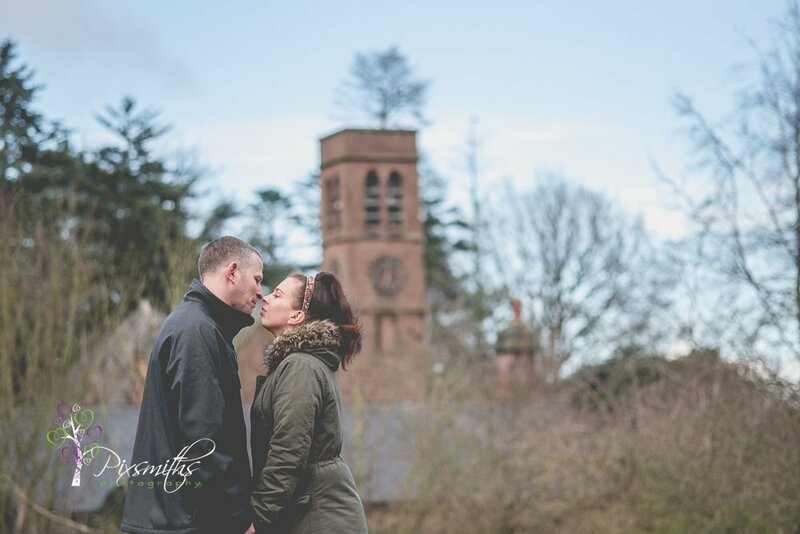 Always a favourite place to shoot whatever season ..always something different. 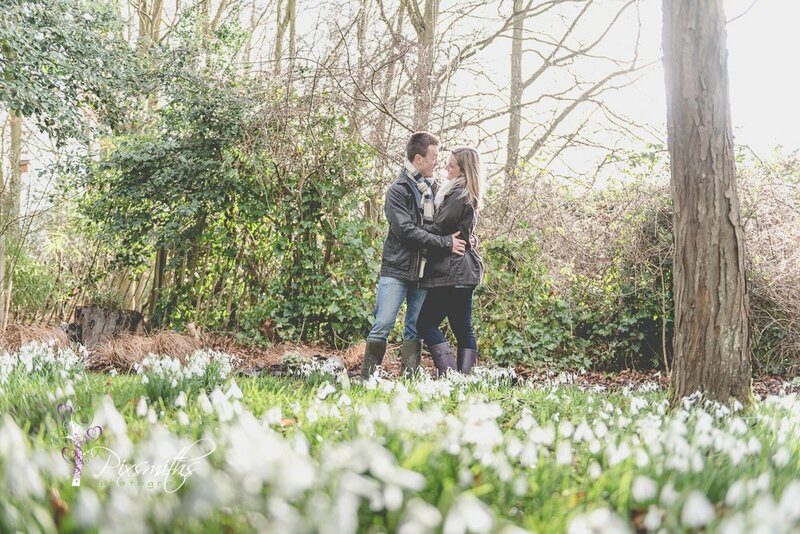 This time we were blessed with a carpet of snowdrops in the woodland area towards the back of the walled garden. 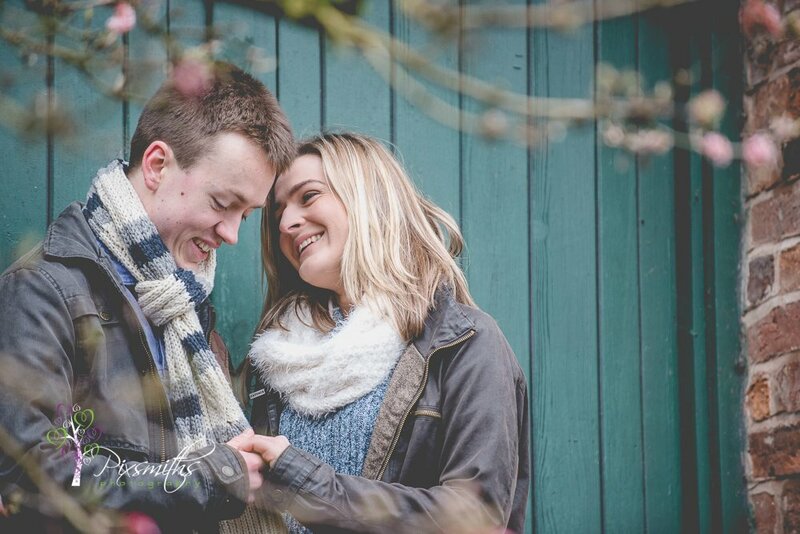 Thank you Claire and Nathan for braving the elements, really happy with your images and know you love them too. 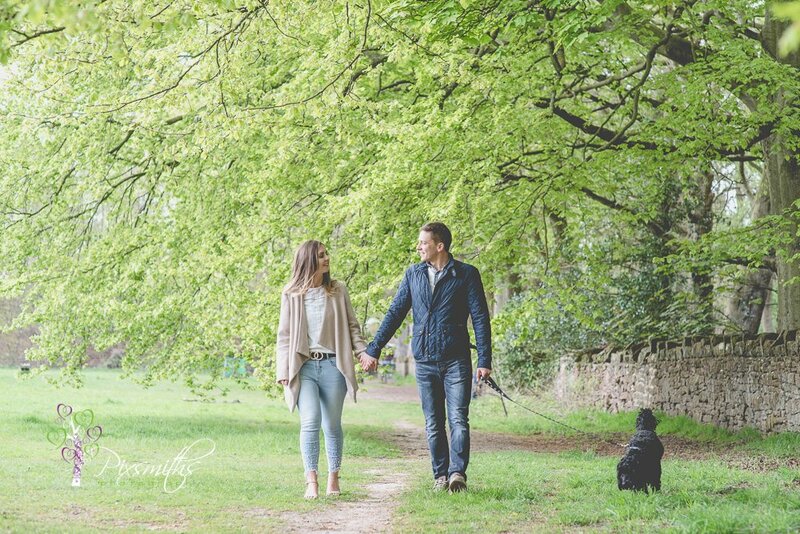 Their images will be beautifully used in their personalised guest signing book. 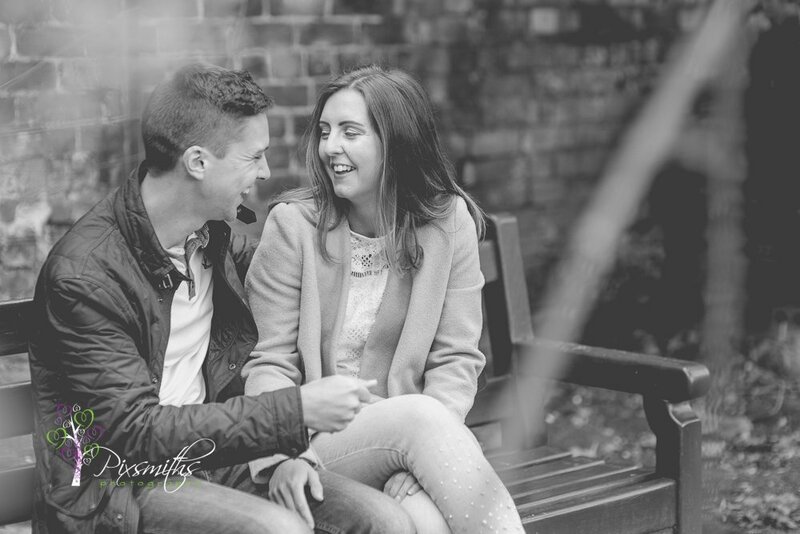 What a sunny-natured couple – their joy was so evident. 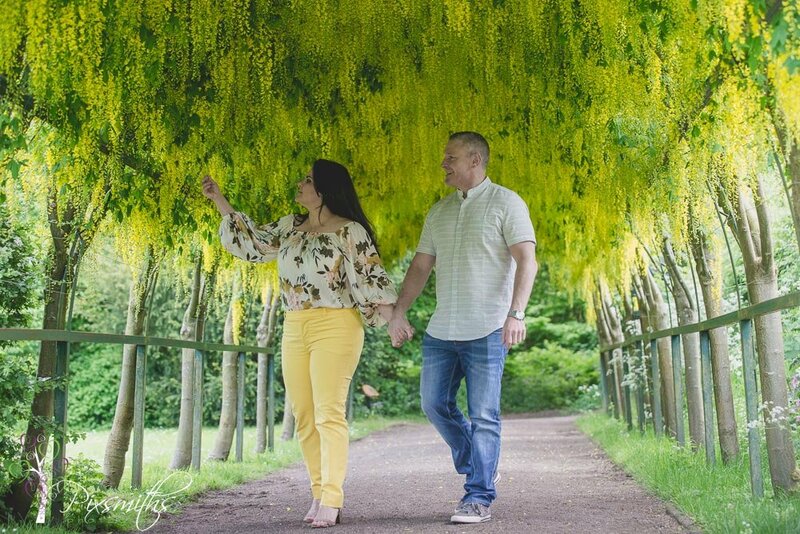 They were enthralled with the location and the floral beauty. 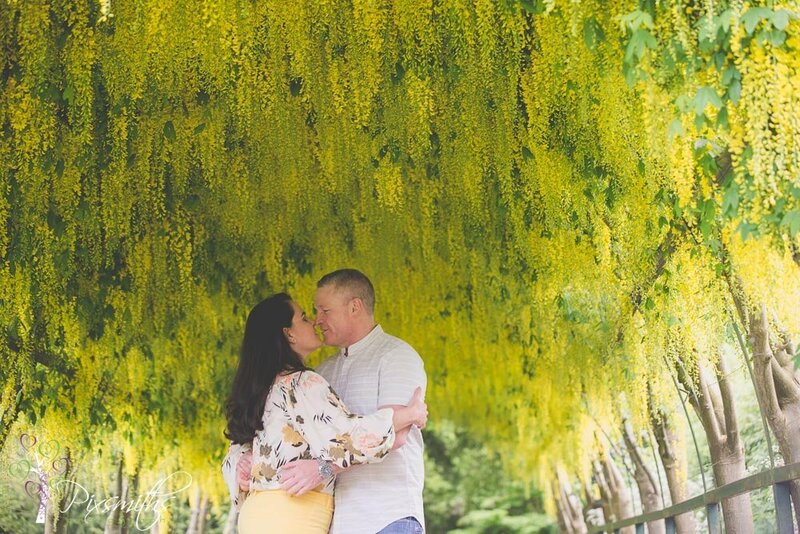 Even more so when they saw the Laburnum arch – almost in full bloom – well a match made in heaven! 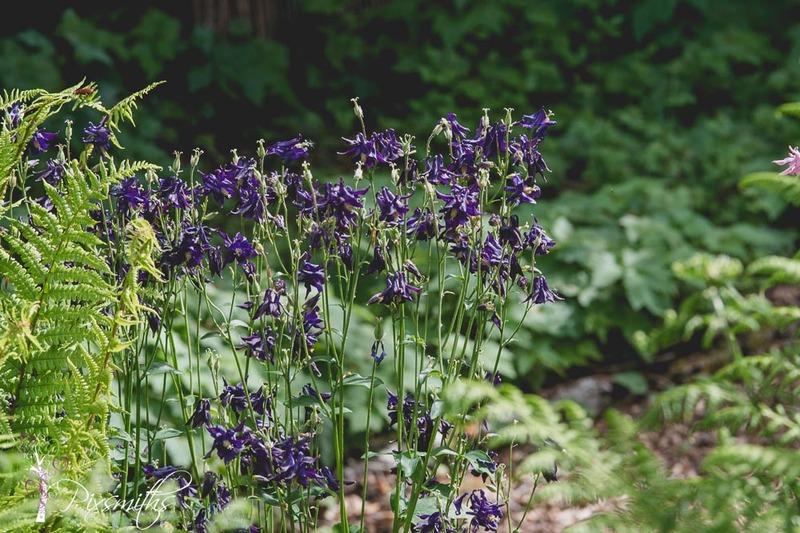 We met one of the rangers just beforehand who gave us updates on the garden – nearly time for poppies to bloom. 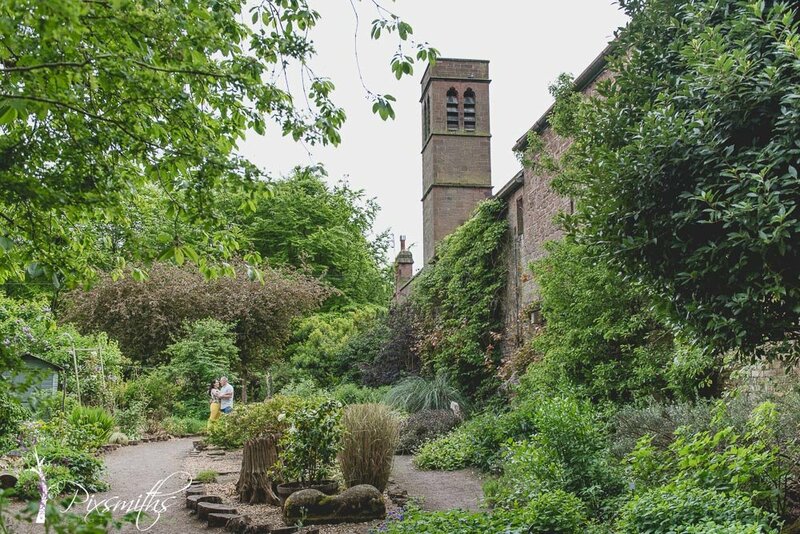 Also the kestrel is still residing in the old tower and is currently sitting on 5 eggs. 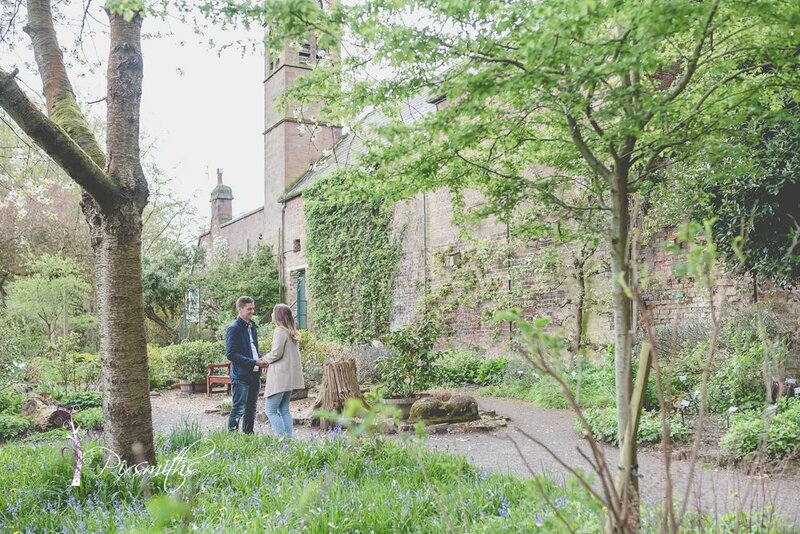 If you go in to the coach house – just by the Barking mad cafe there are monitors in there so they can check for the new hatchlings. 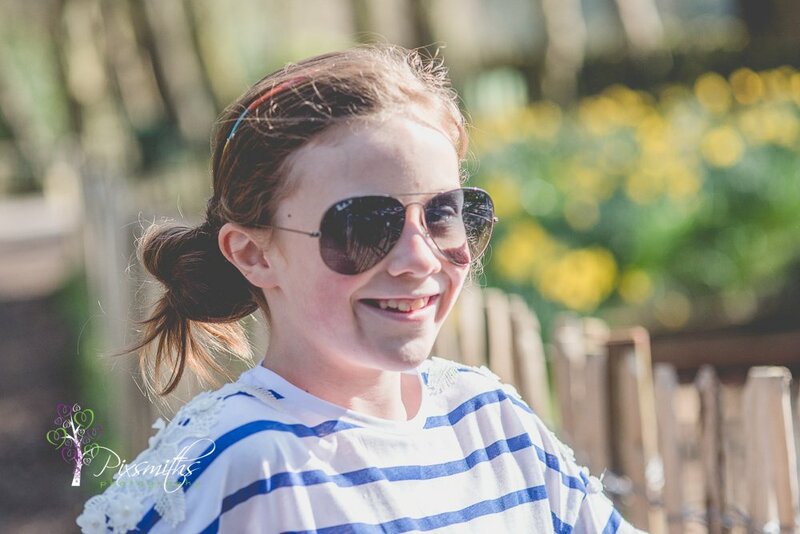 Must go again soon!